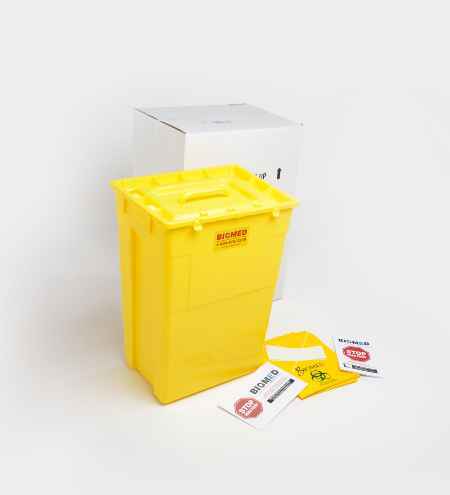 All products and prices include delivery, pickup & disposal - with no contracts or hidden fees! 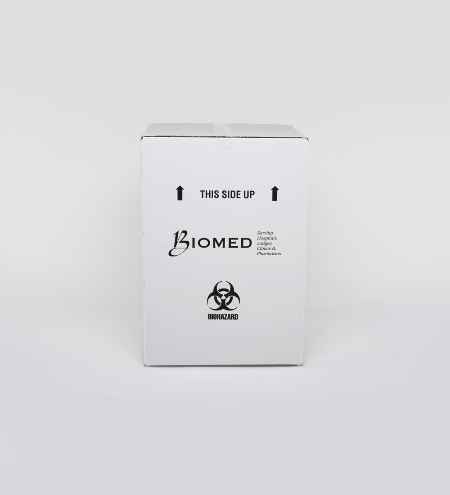 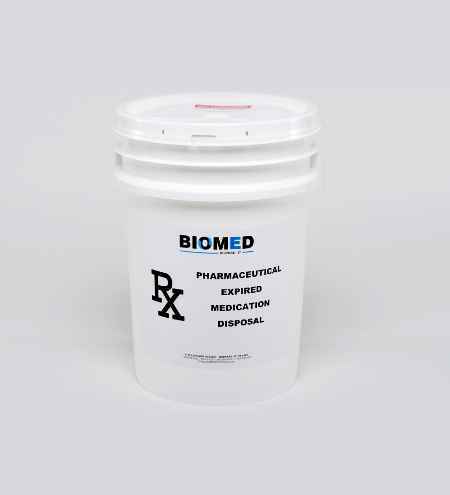 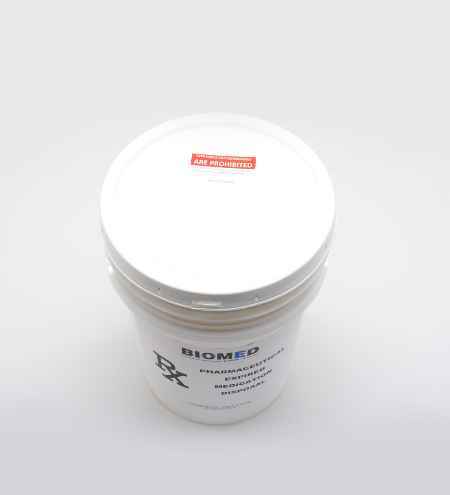 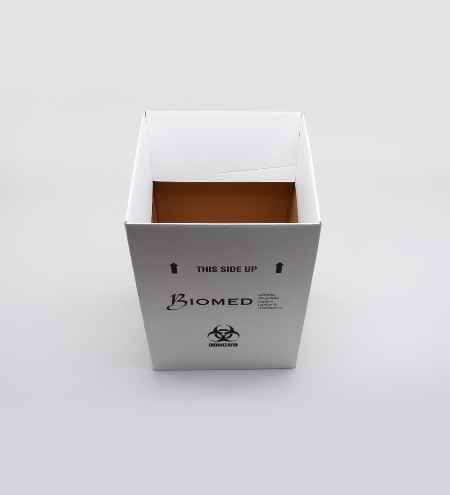 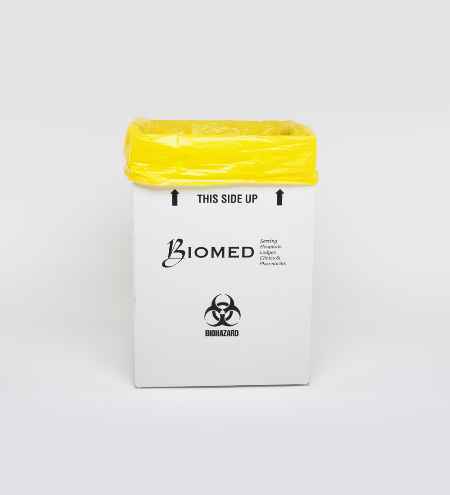 Welcome to the new shopping cart of Biomed Dispose-it. 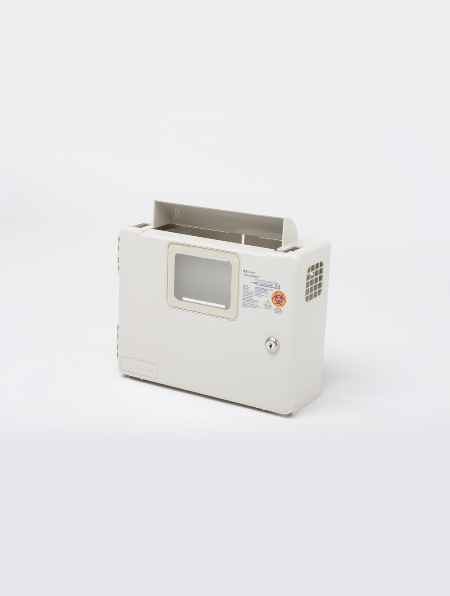 To view the older product page, please click here. 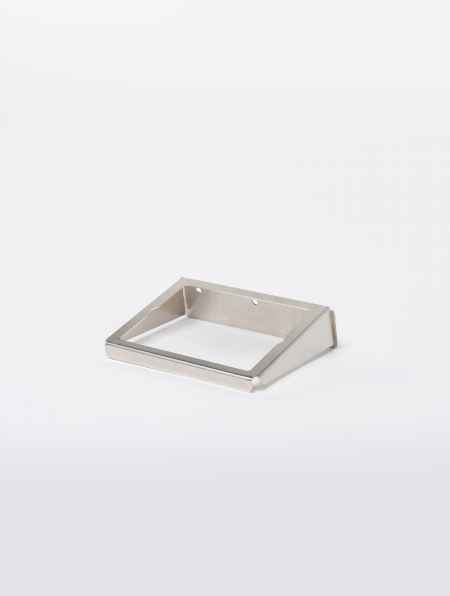 DimensionsLength:3 1/4 " Width:3 1/4 " Height:6 "
DimensionsLength:3 5/8 " Width:3 7/8 " Height:7 5/8 "
DimensionsLength:3 1/2 " Width:3 1/2 " Height:10 1/2 "
Description 1.5 Litre red biohazard transportable sharps container are conveniently sized for easy transport in situations such as EMS, Ambulance, Home Health care or psychiatric units. 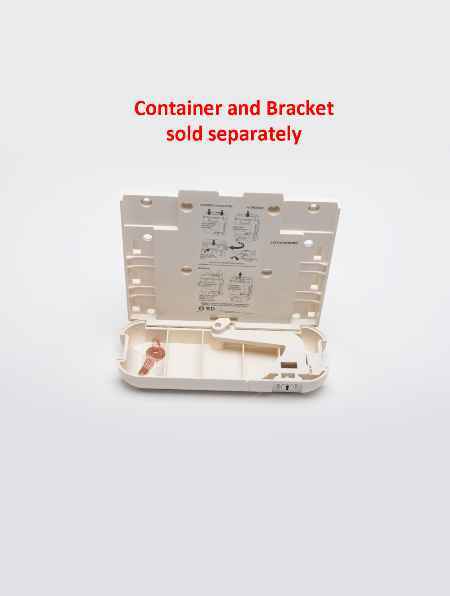 The 1.5 litre capacity features a square base for added stability and a leak-resistant screw cap to cover the disposal opening. 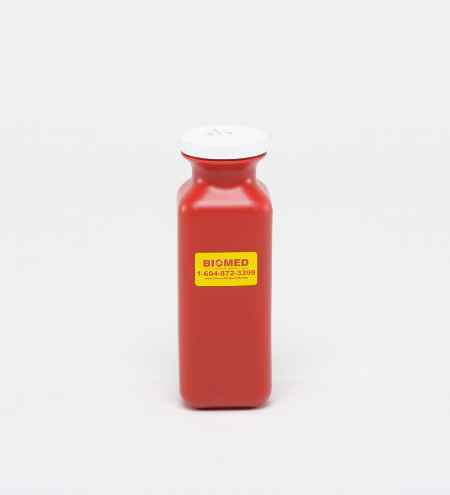 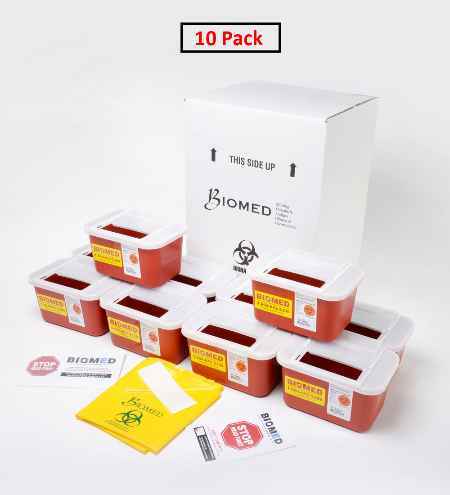 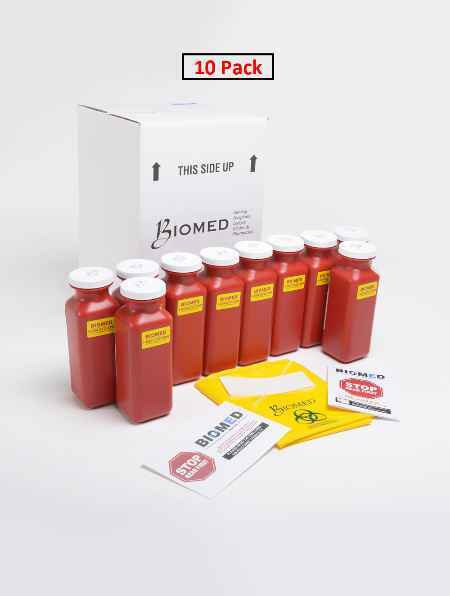 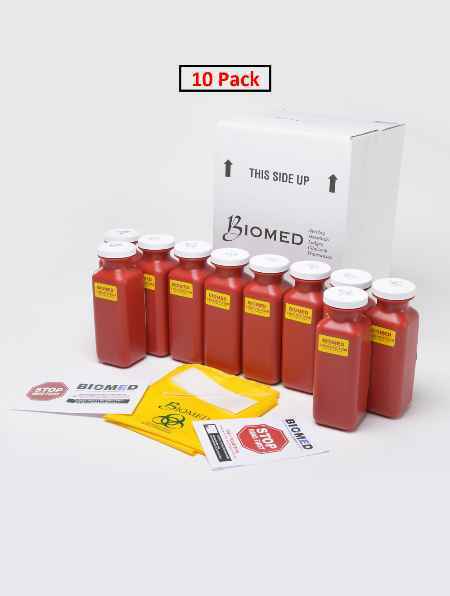 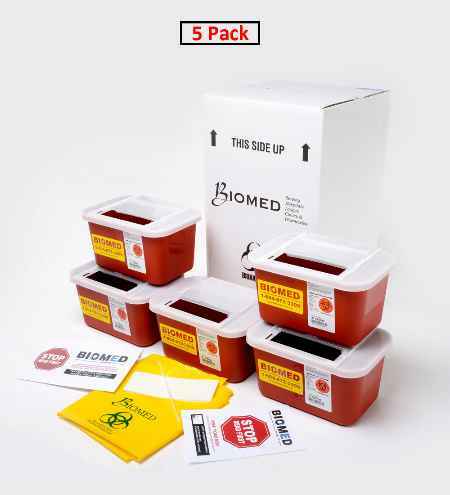 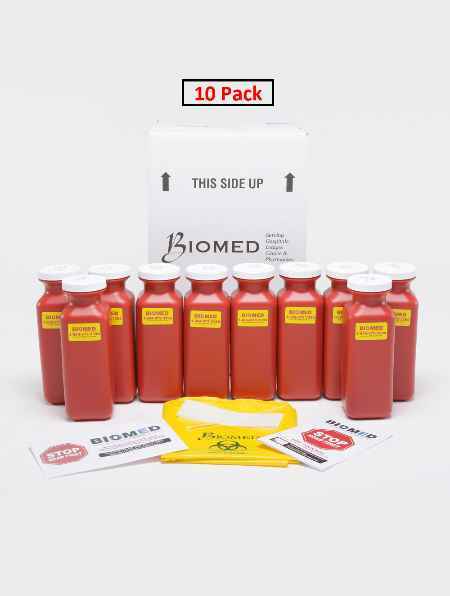 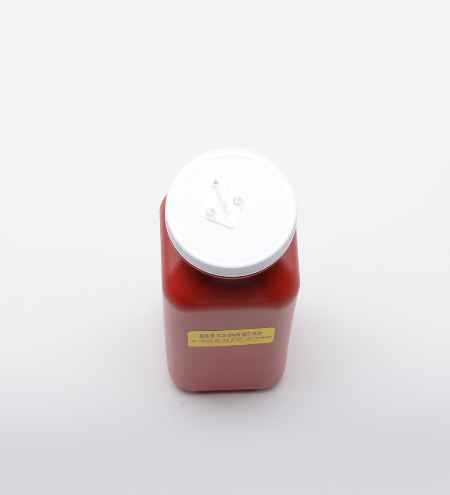 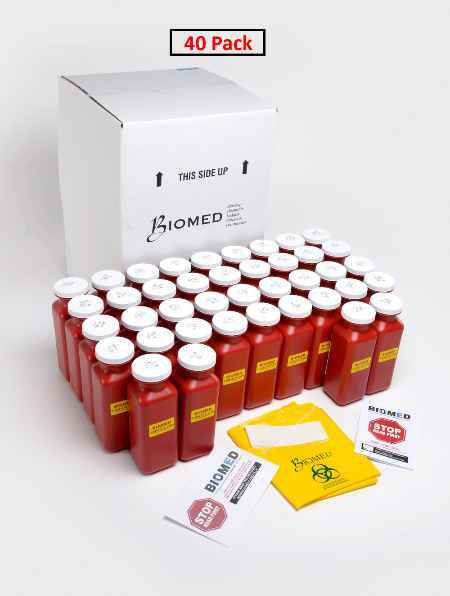 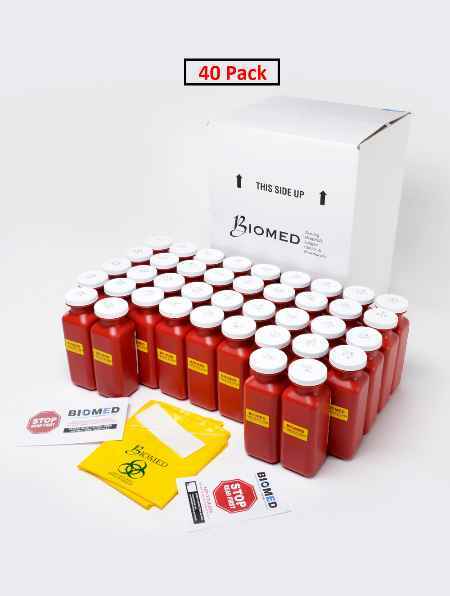 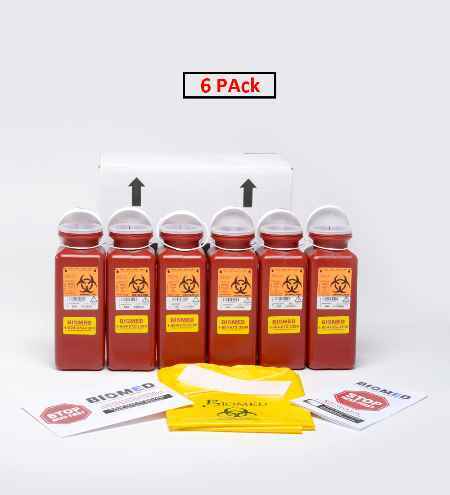 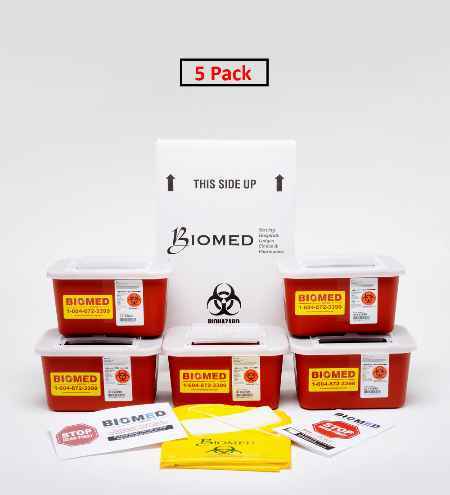 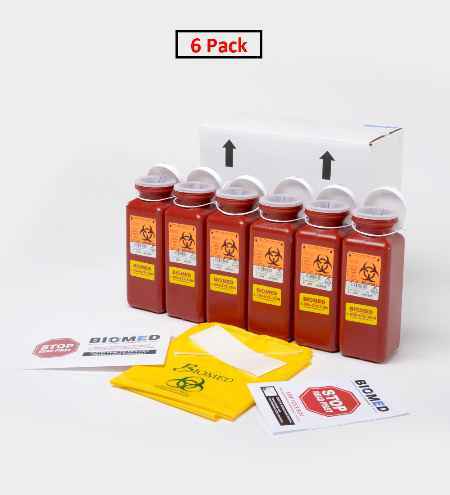 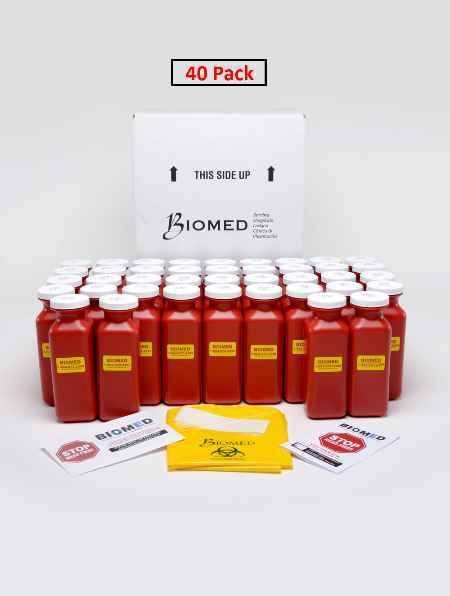 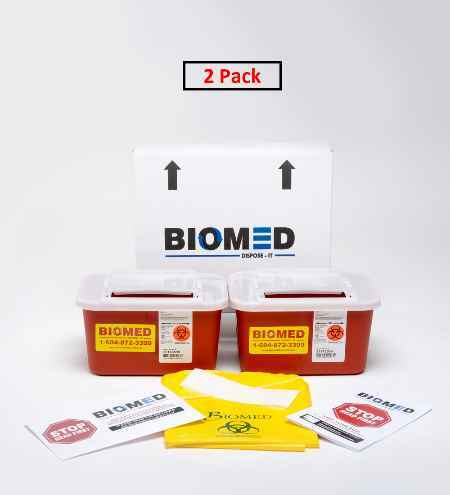 DimensionsLength:3 1/2 " Width:3 1/2 " Height:10 "
DimensionsLength:5 1/2 " Width:4 1/2 " Height:8 "
DimensionsLength:10 " Width:7 " Height:6¼ "
Description 3.75 Litre red biohazard sharps container has a economical horizontal drop lid that maximizes the container volume. 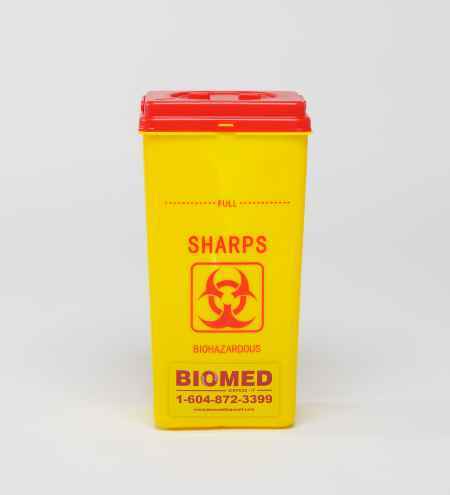 Large horizontal openings accommodate syringes. 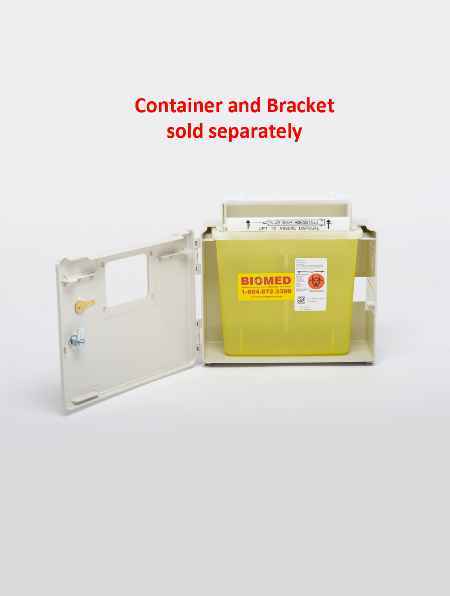 Containers lock for final disposal. 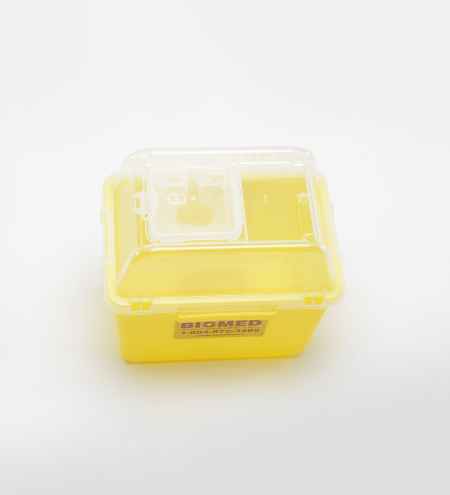 Nestable containers save valuable storage space. 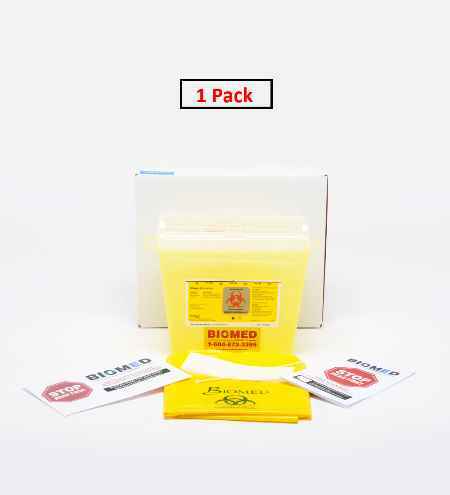 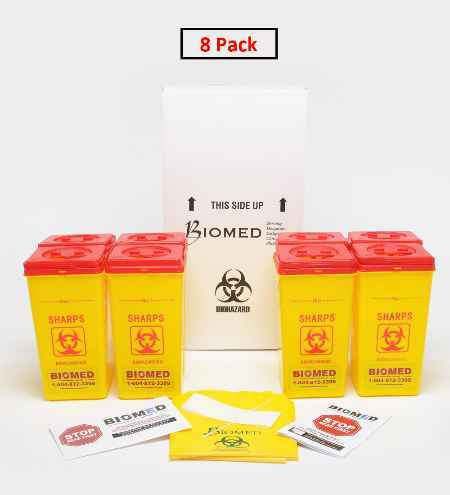 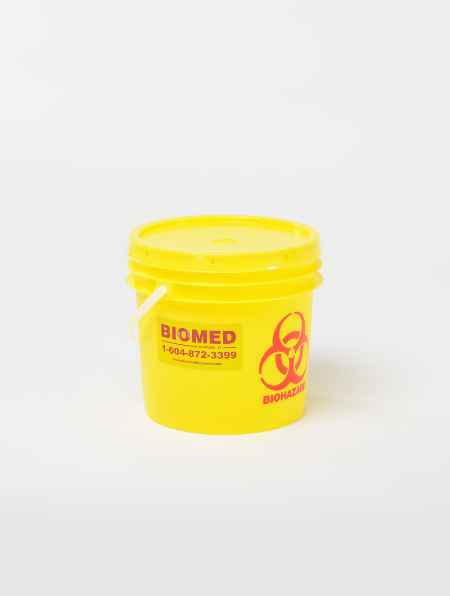 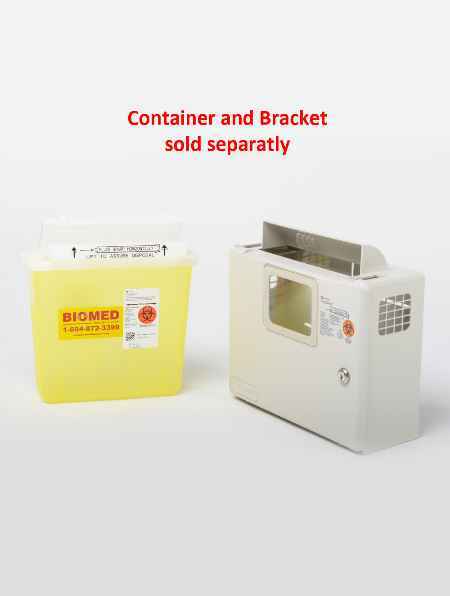 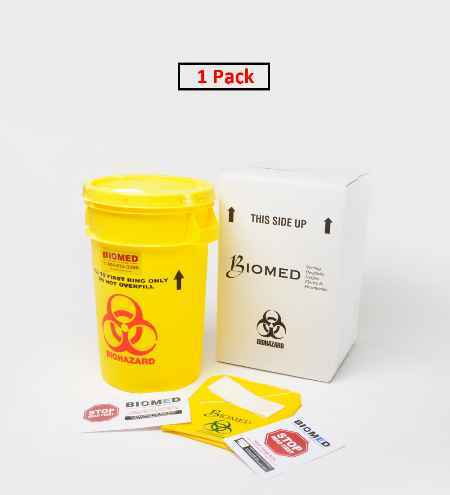 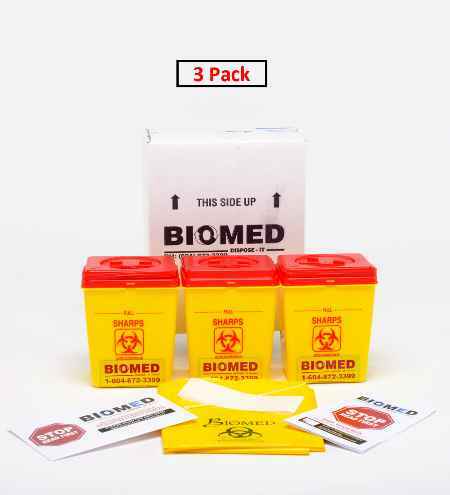 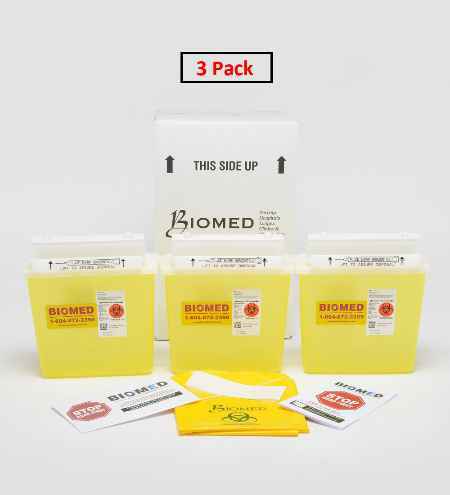 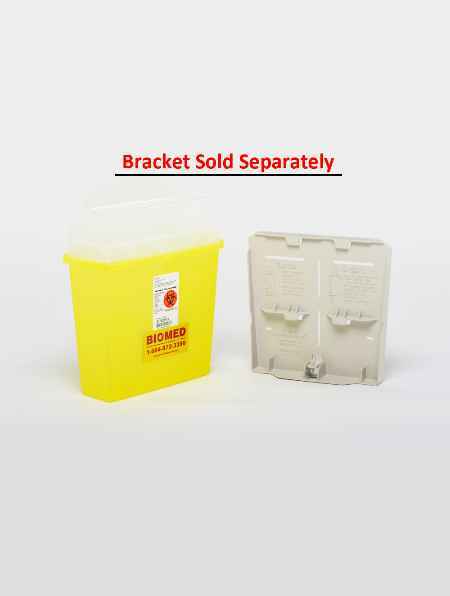 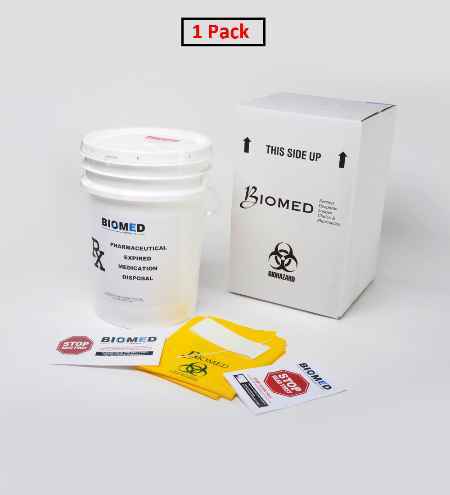 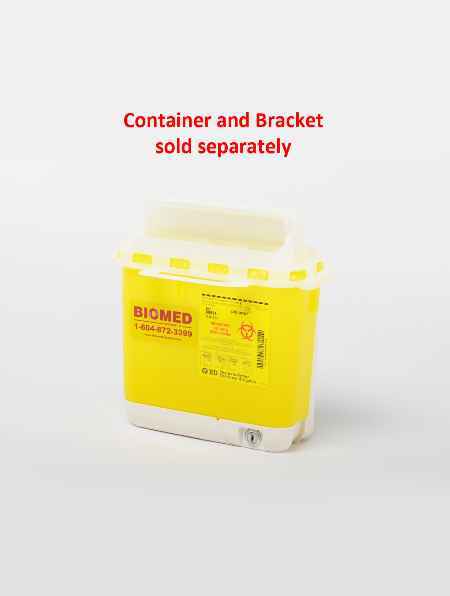 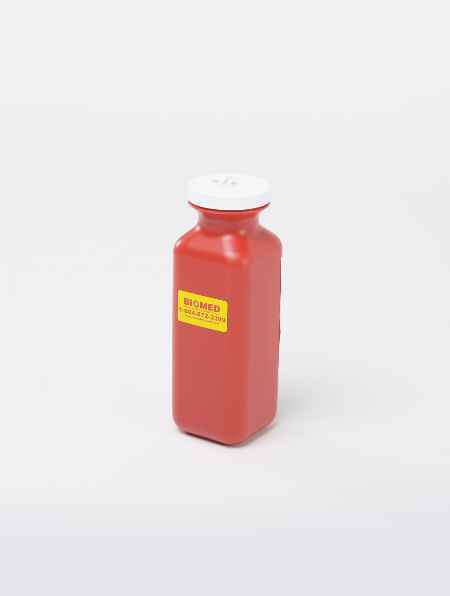 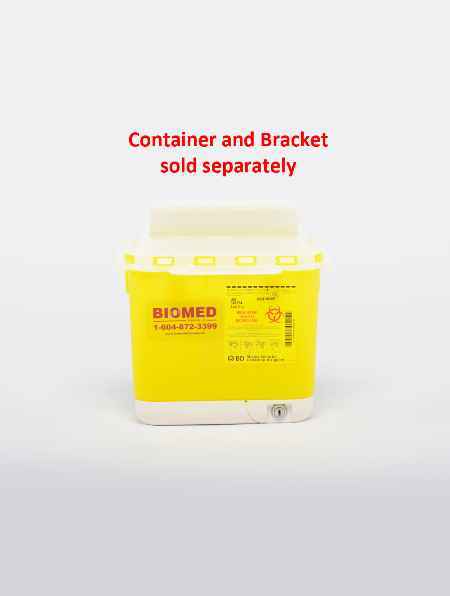 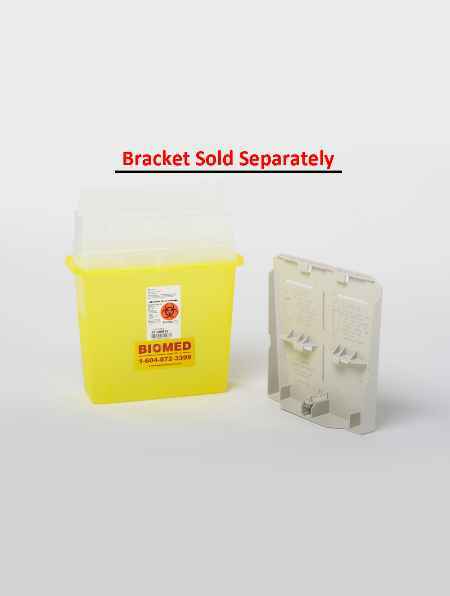 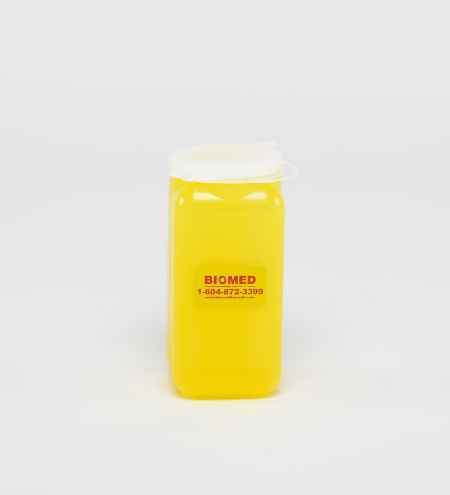 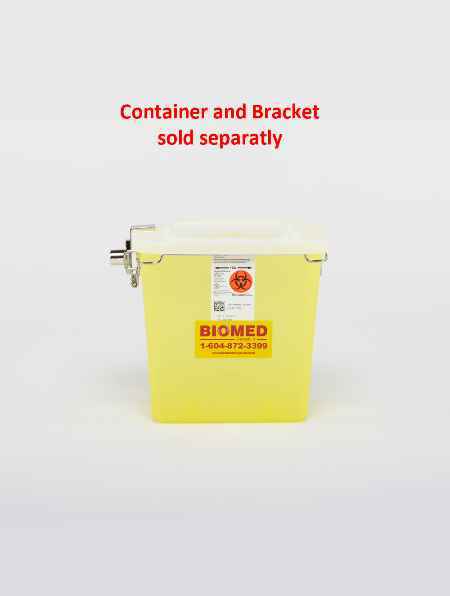 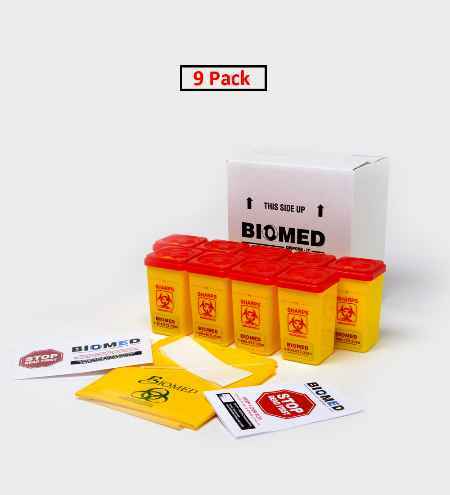 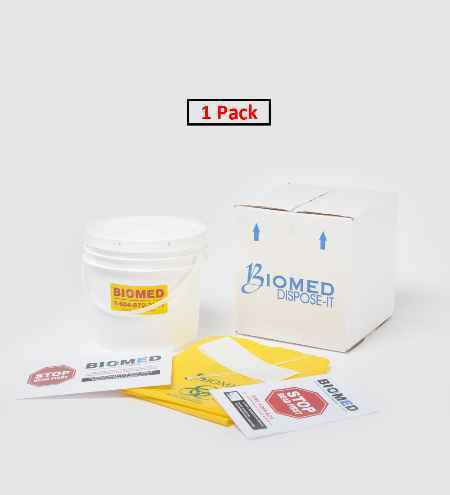 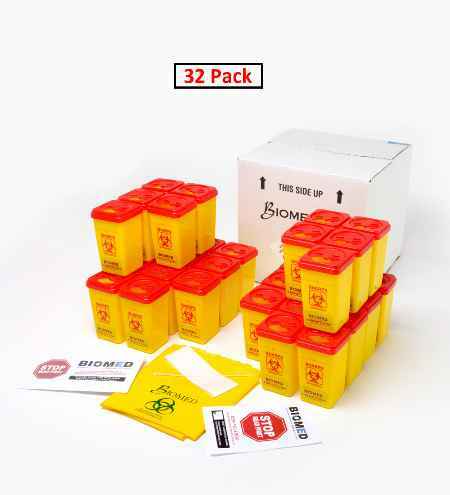 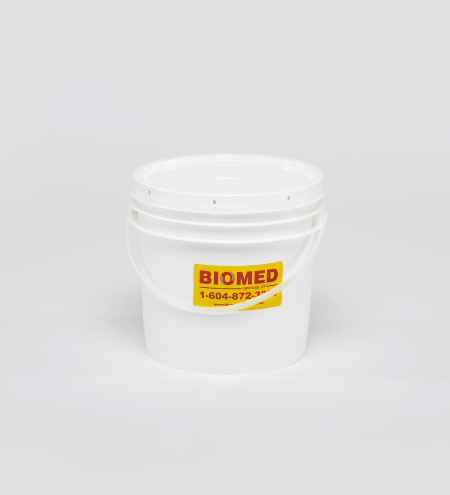 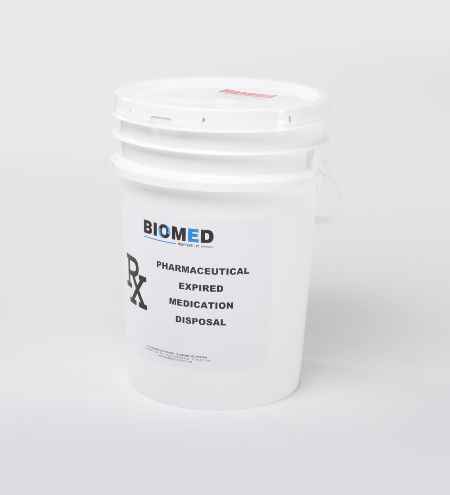 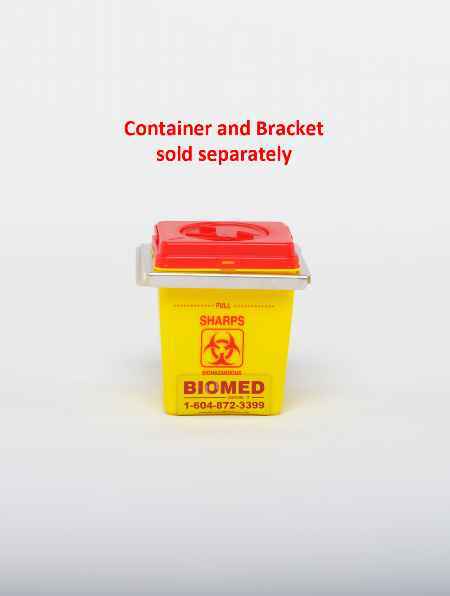 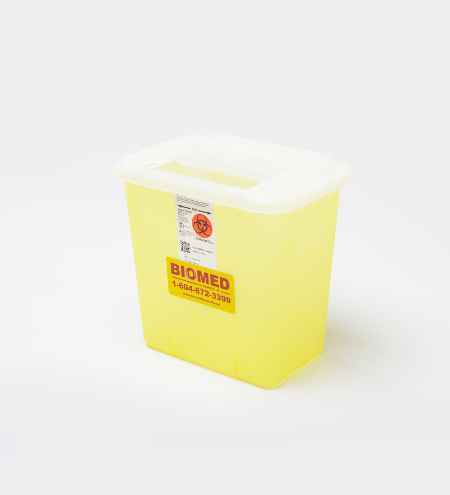 DimensionsLength:8 1/4 " Width:8 1/4 " Height:8 1/4 "
DimensionsLength:9 1/2" Width:3 1/2 " Height:13 "
Description 4.75 Litre yellow biohazard sharps container with clear tops lids, horizontal loading, non-mechanical sharps opening. 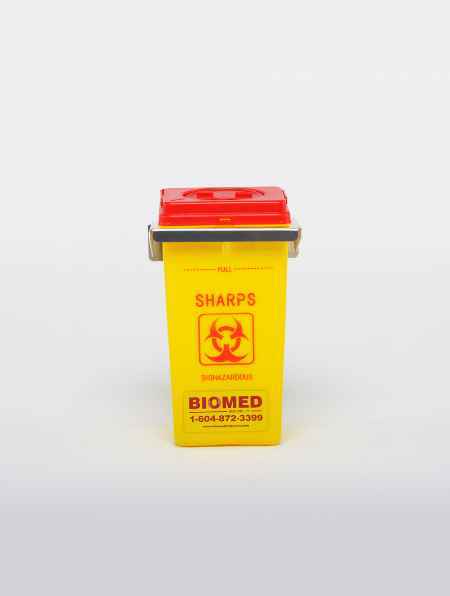 Tortuous-path design impedes hand entry, one-hand, one step sharps depositing. 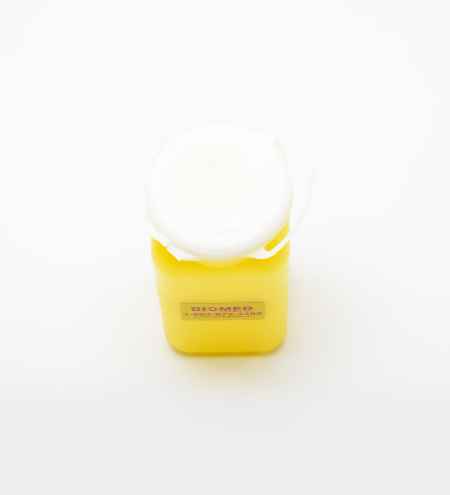 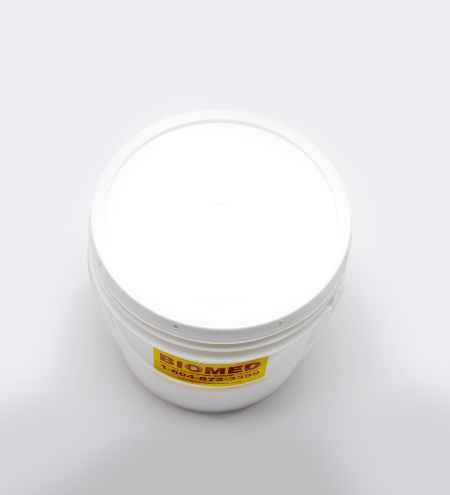 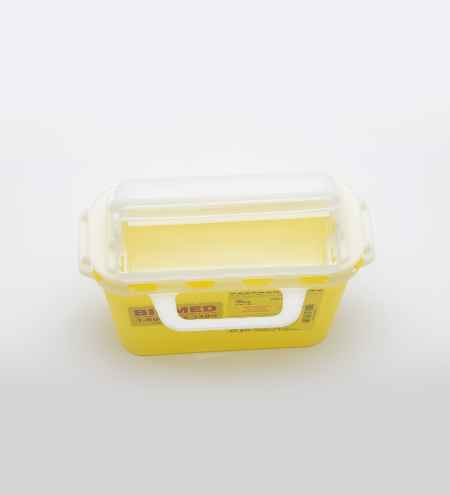 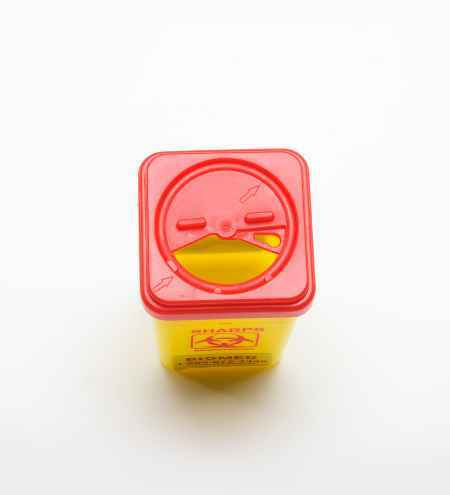 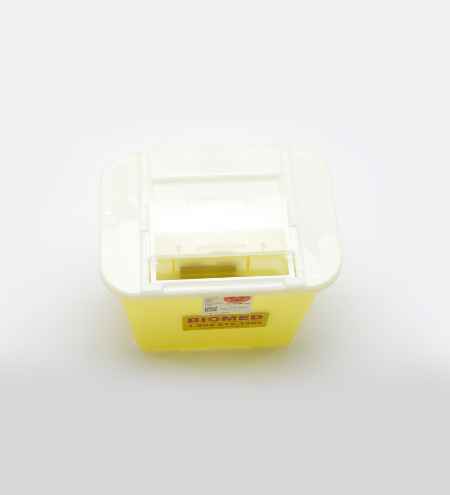 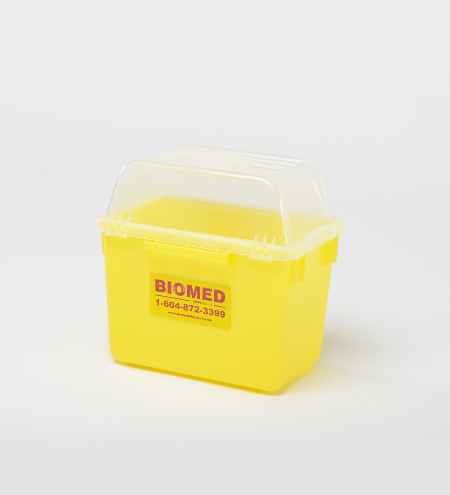 DimensionsLength:5 1/2 " Width:4 1/2 " Height:12 "
DimensionsLength:13 " Width:5 " Height:12 1/2 "
Description 5 Litre yellow biohazard sharpstar container with forced horizontal drop lid. 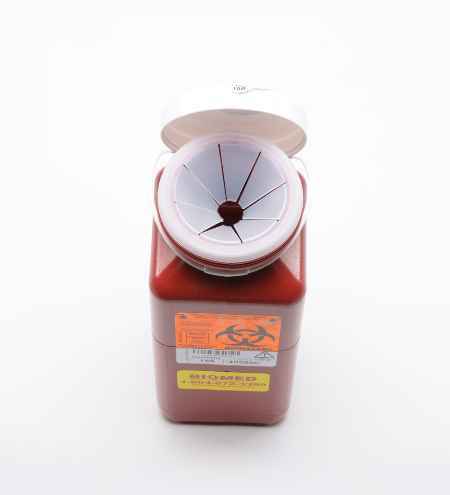 The sharpstar family of containers is engineered with controls to prevent overfilling and limit accidental or intentional access to container contents. 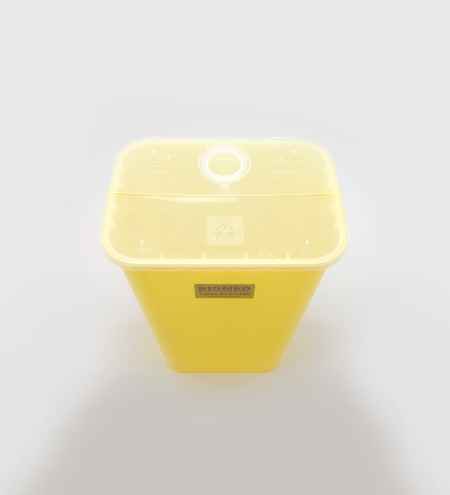 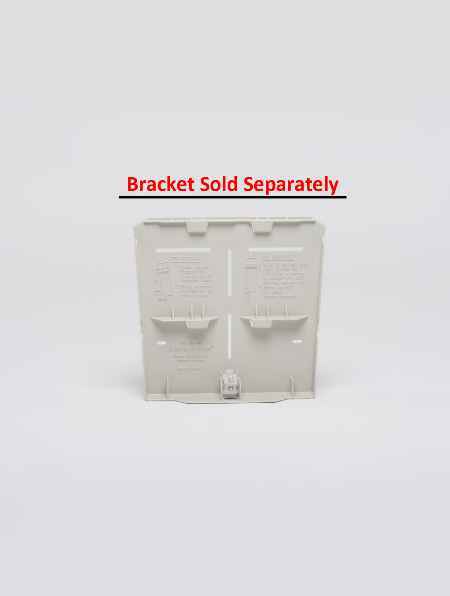 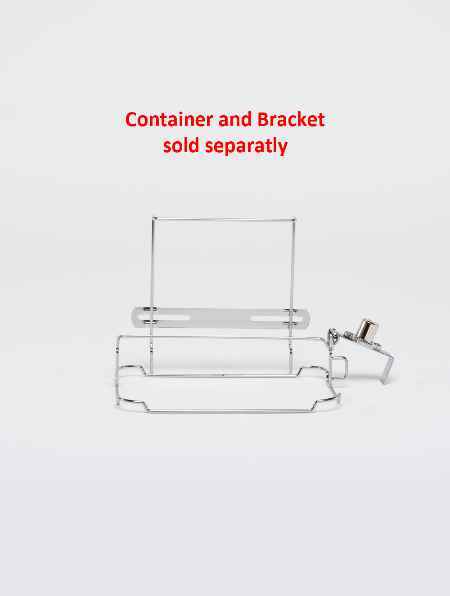 Minimizes the potential for overfilling by stopping the lid in the FULL position when the container reaches maximum capacity. 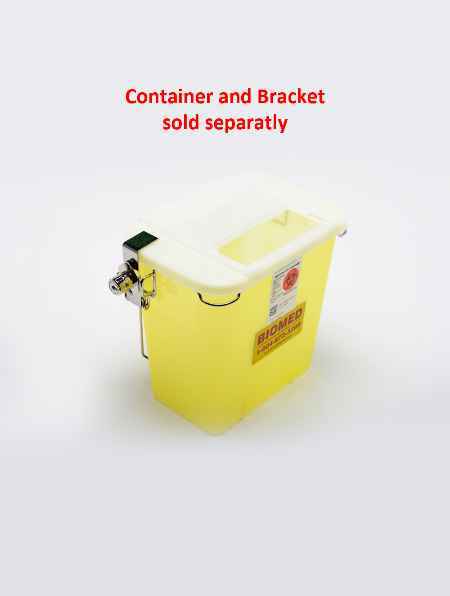 Handles allows for easy transport and lifting of containers. 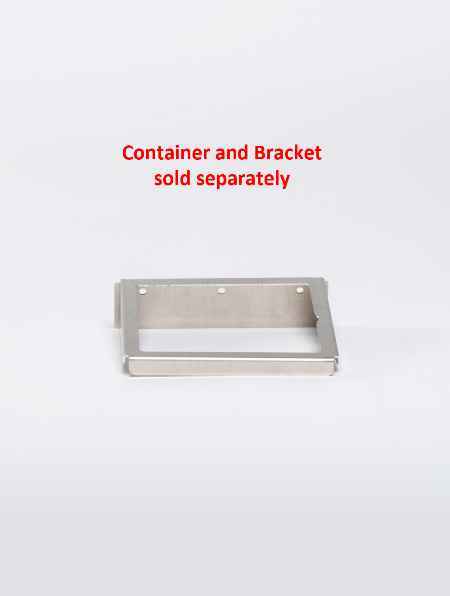 DimensionsLength:11 " Width:5 1/4 " Height:10 "
Description Wall mounted locking bracket is designed to fit the 5.1 BD sharp container. 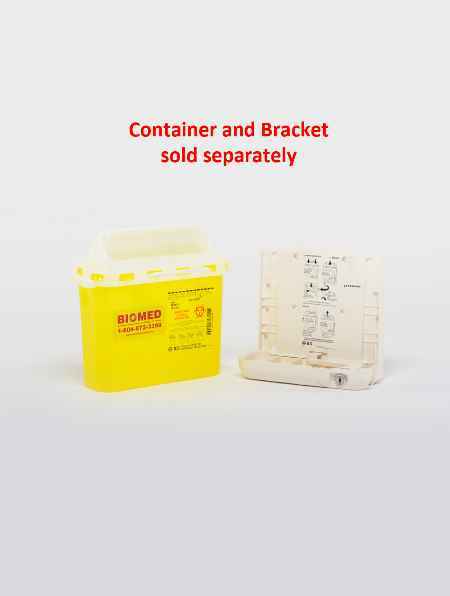 One-hand operation for simple & safe remplacement. 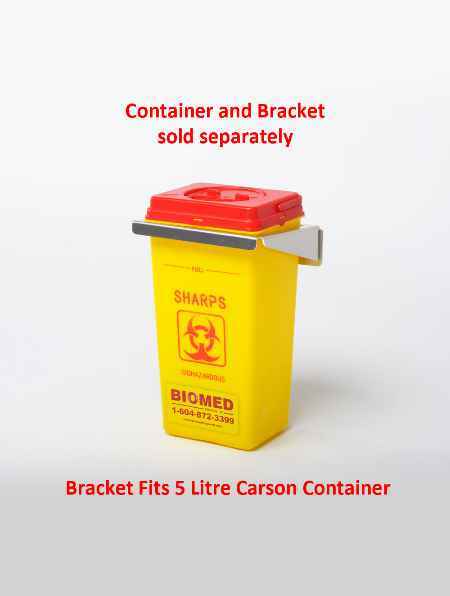 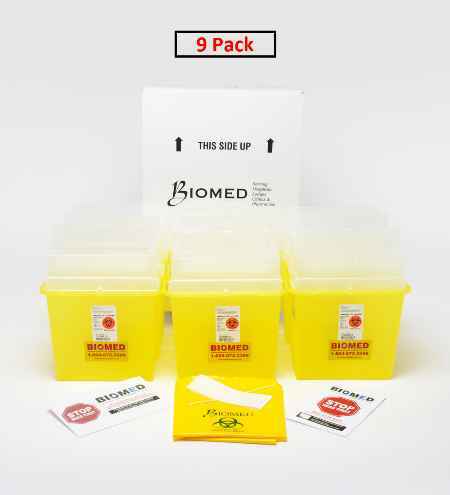 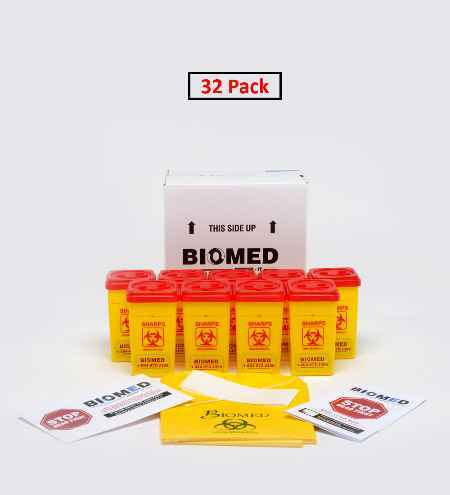 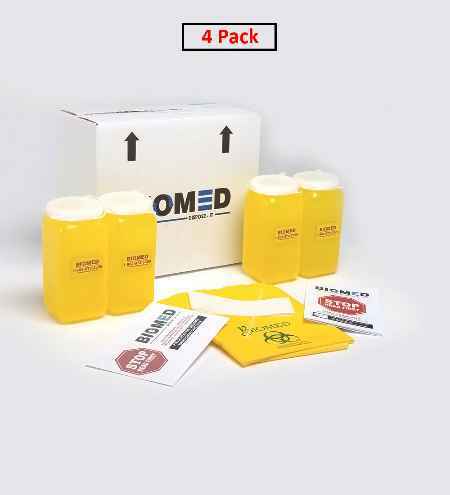 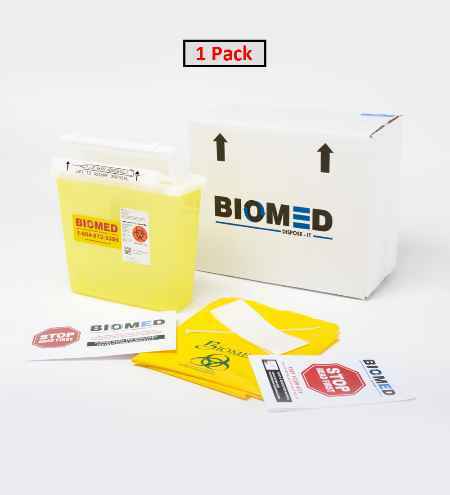 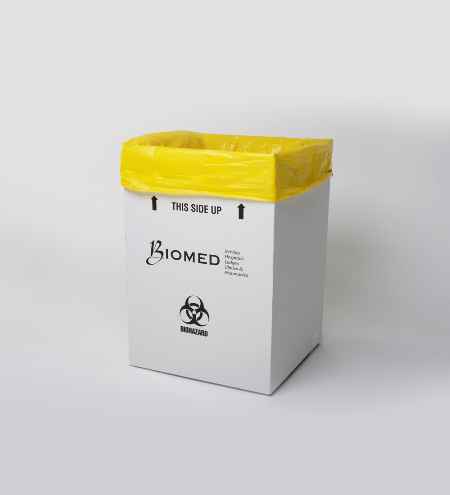 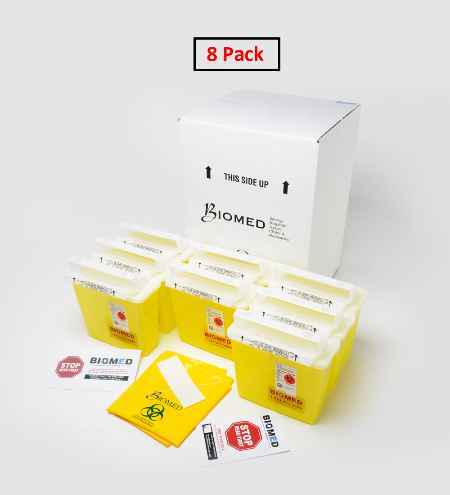 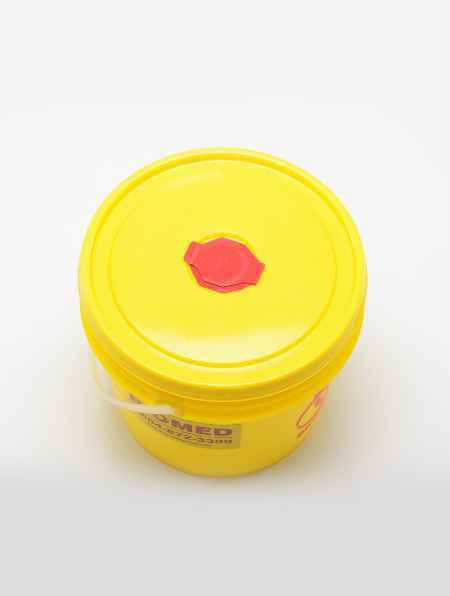 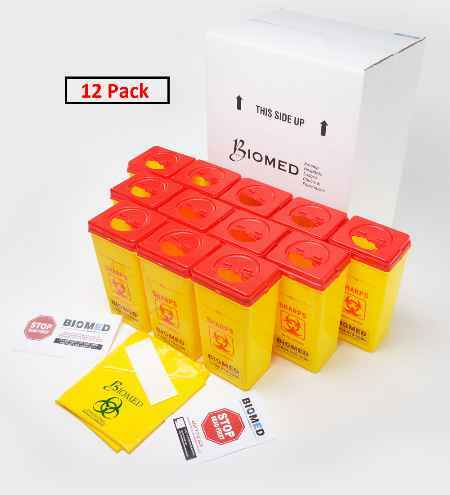 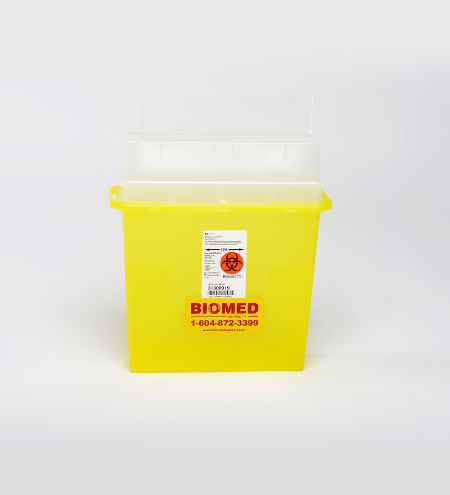 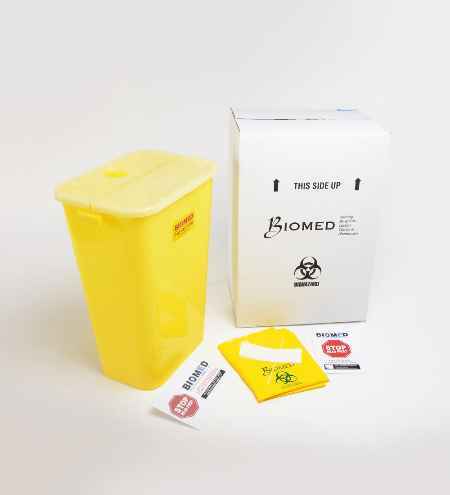 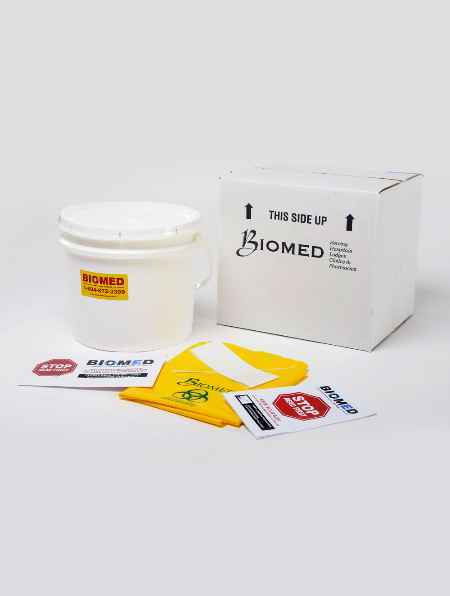 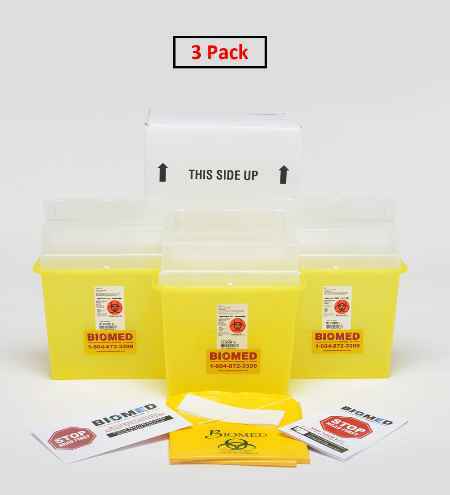 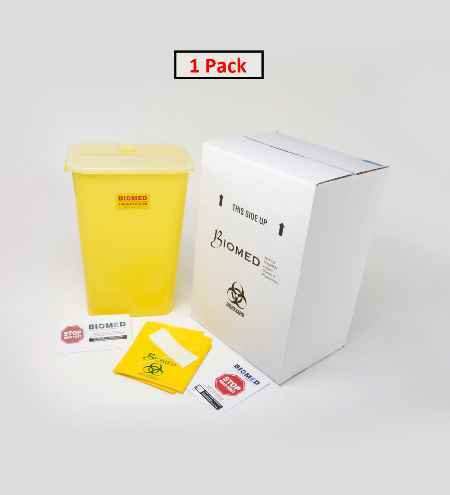 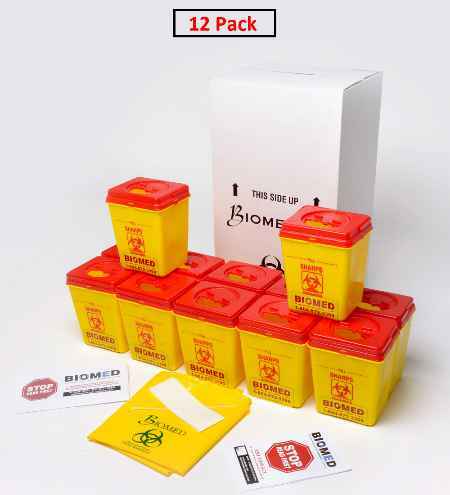 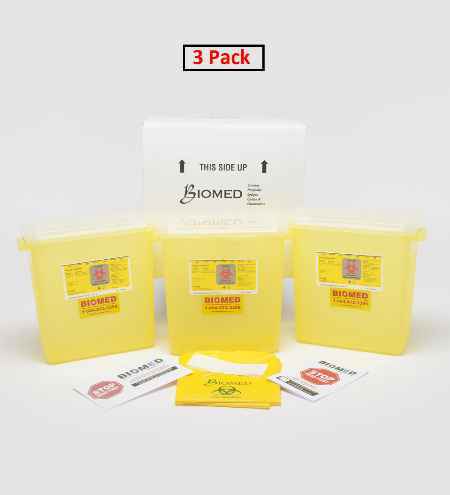 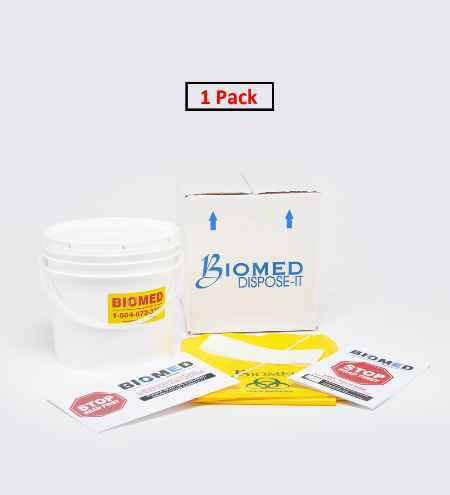 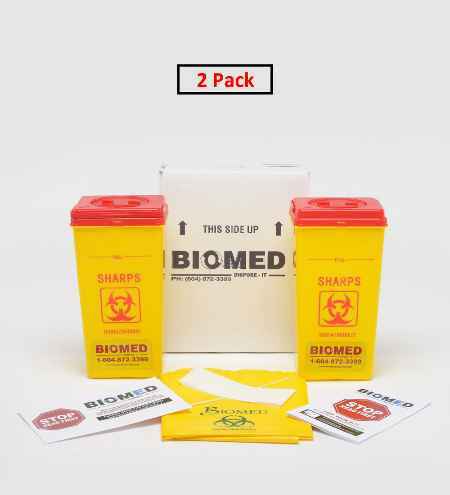 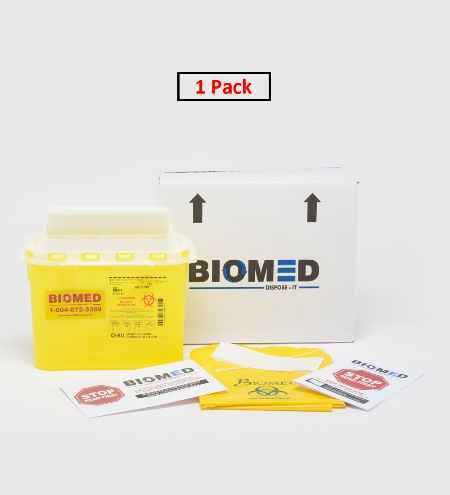 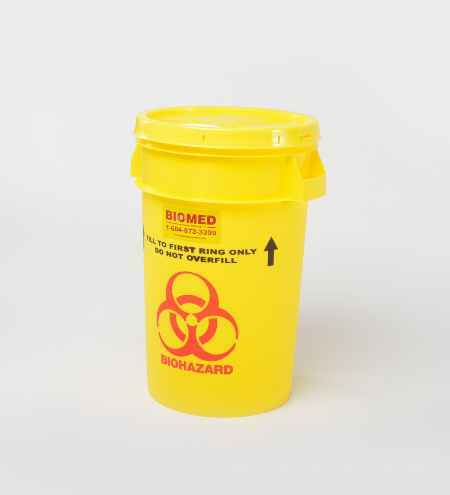 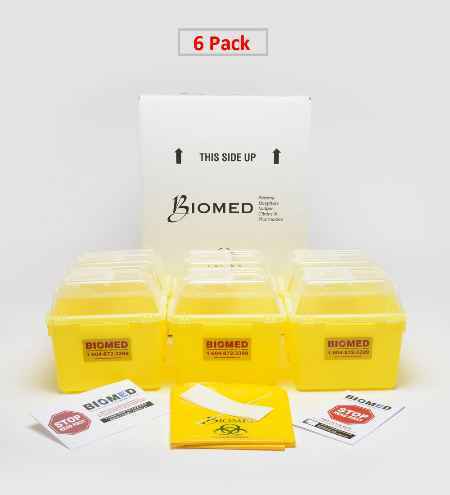 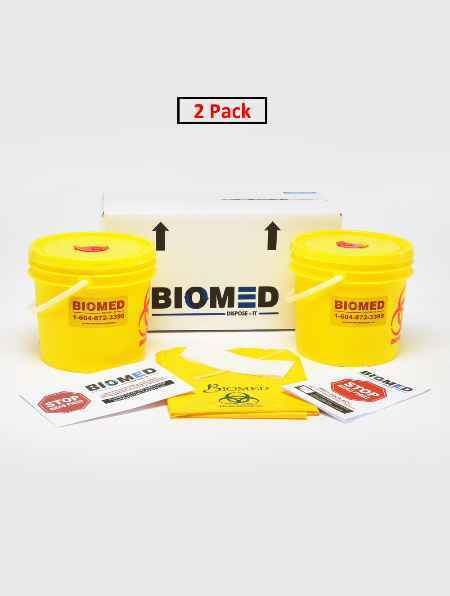 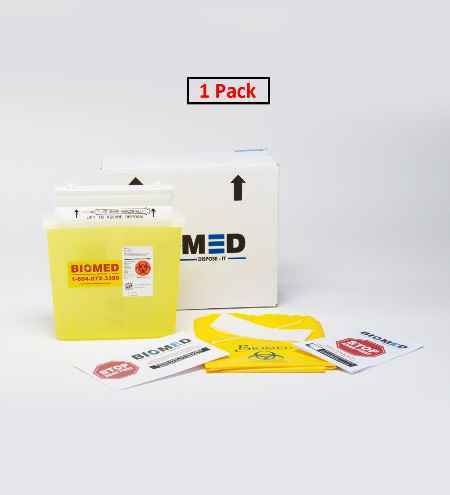 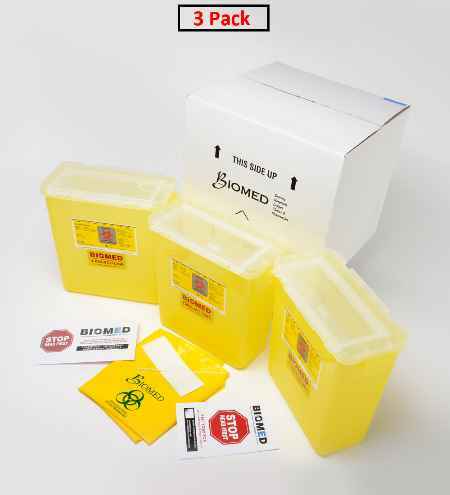 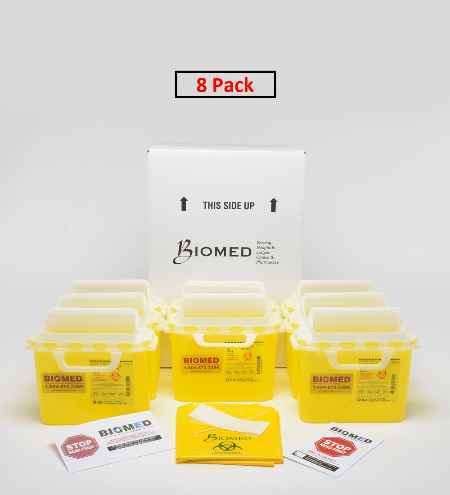 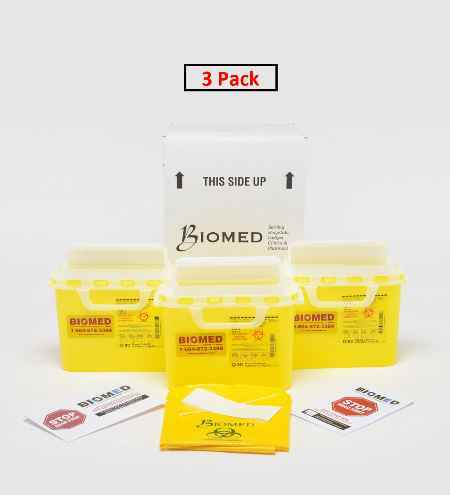 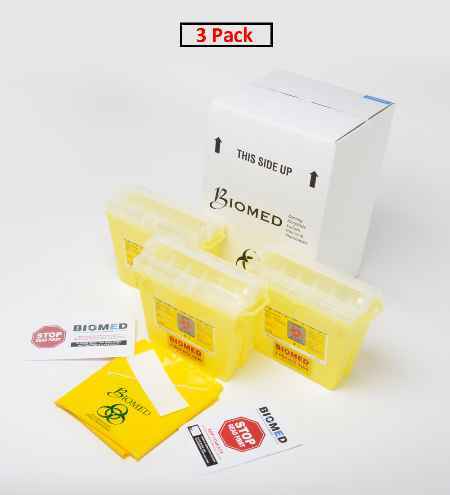 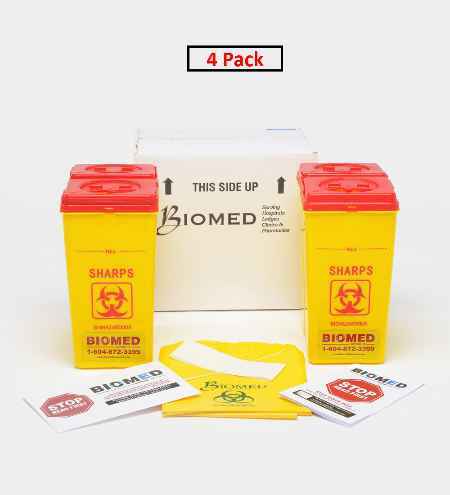 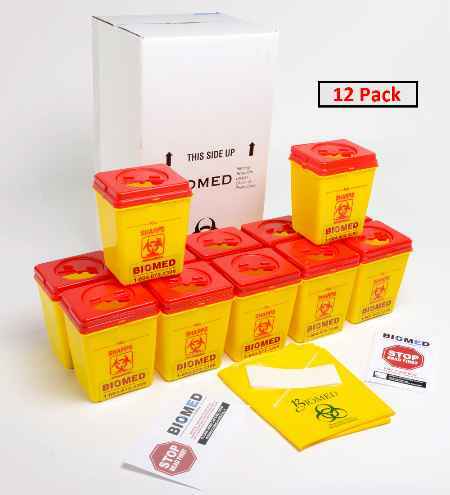 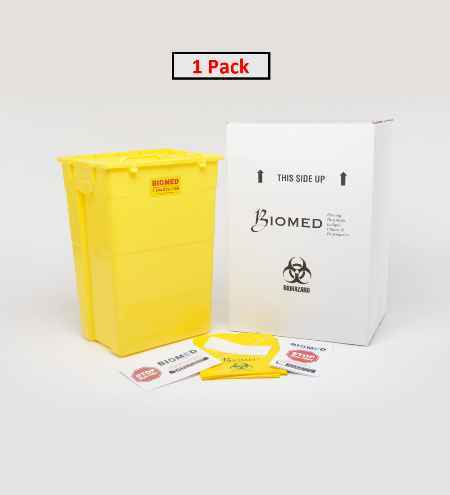 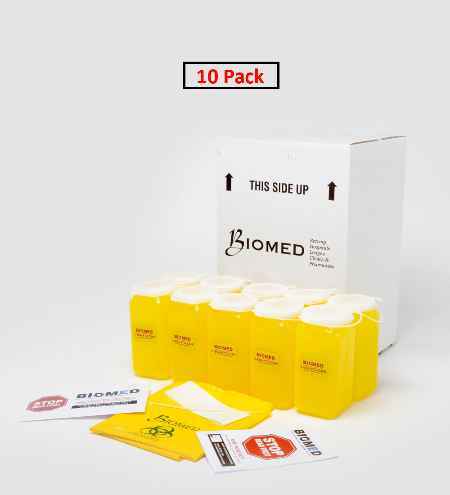 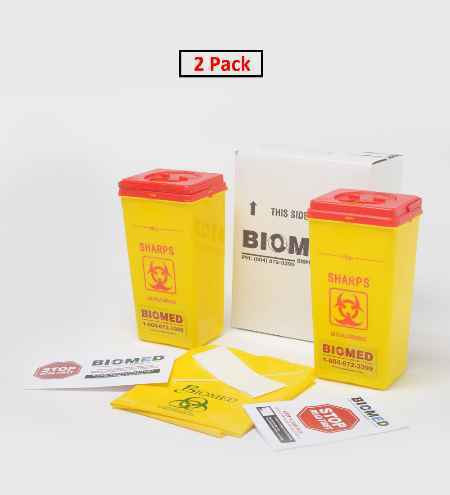 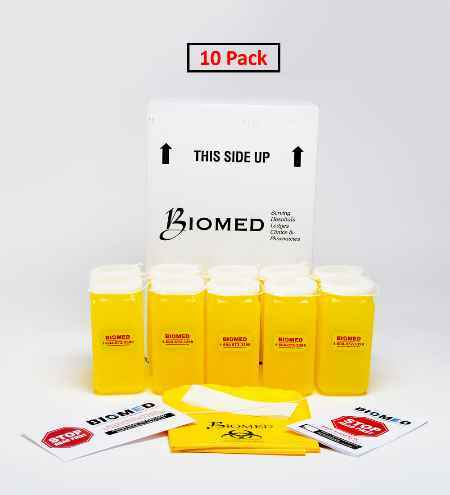 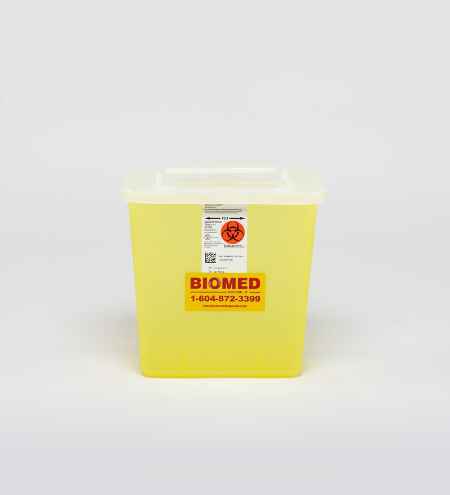 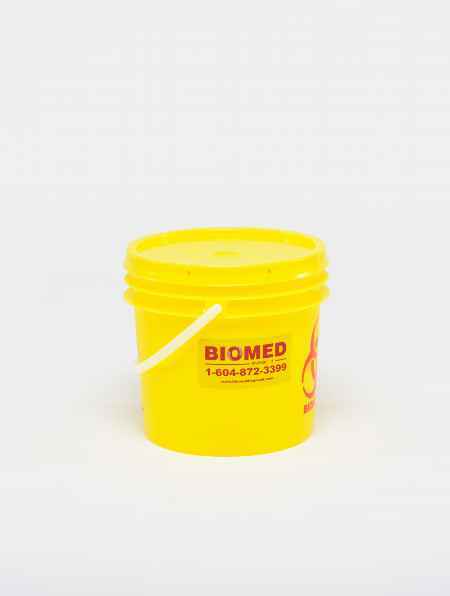 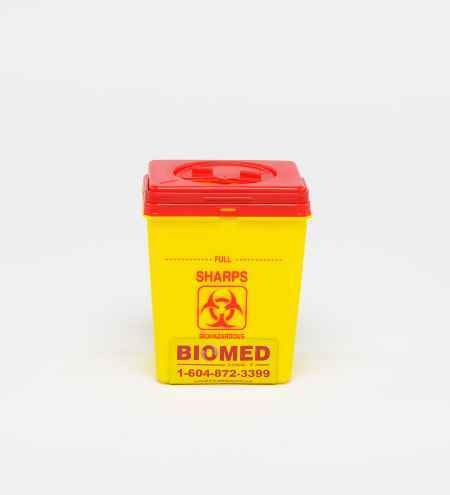 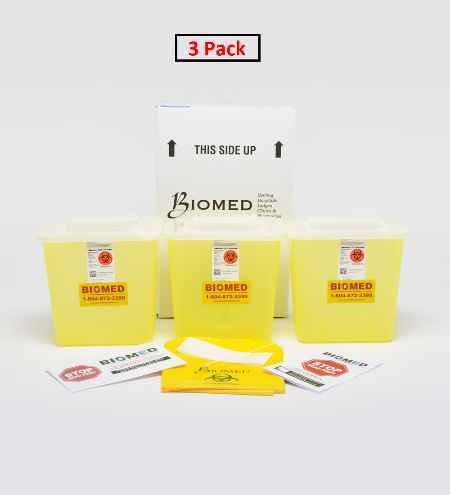 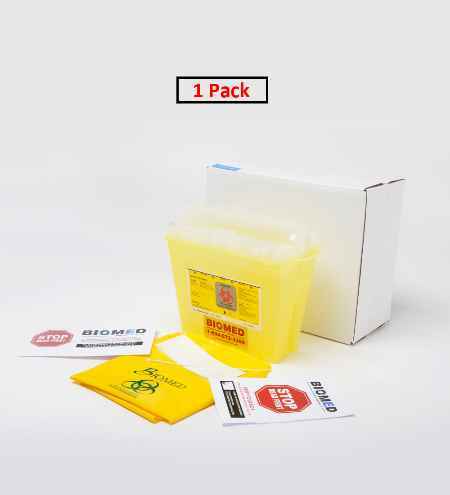 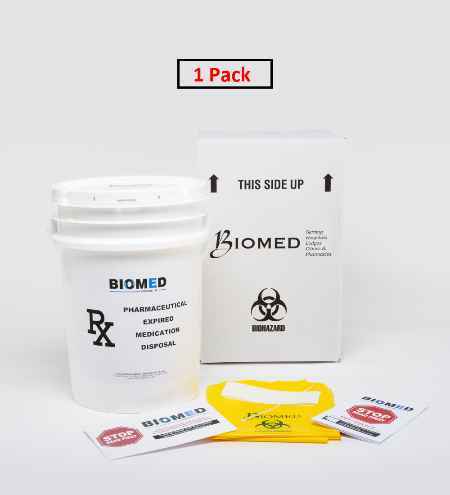 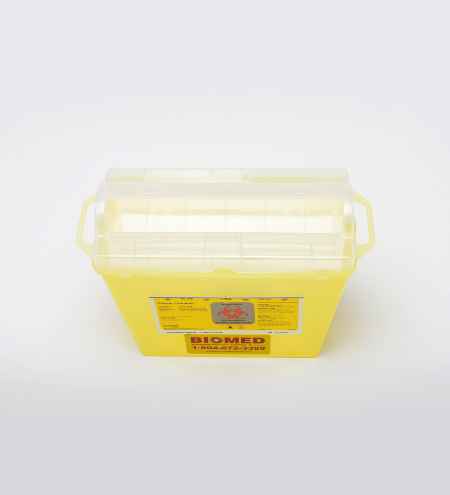 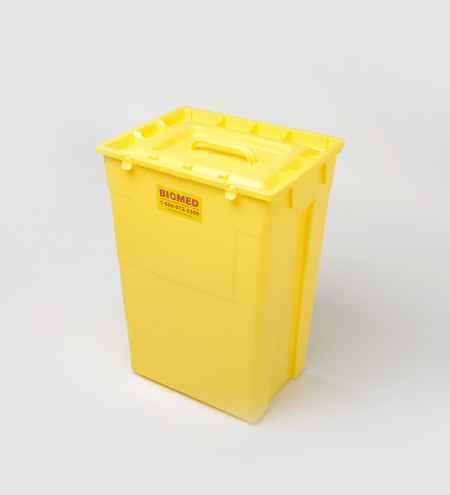 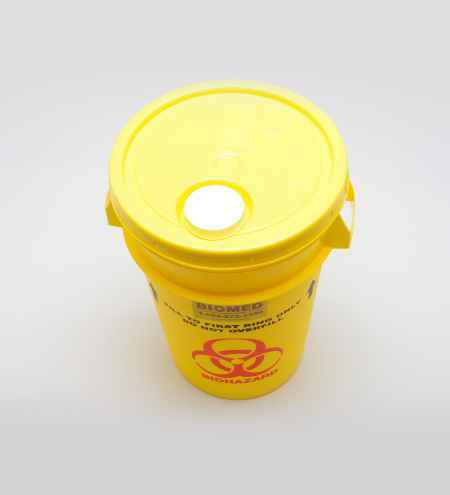 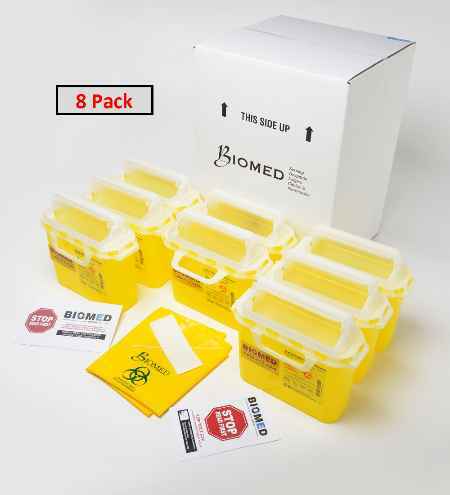 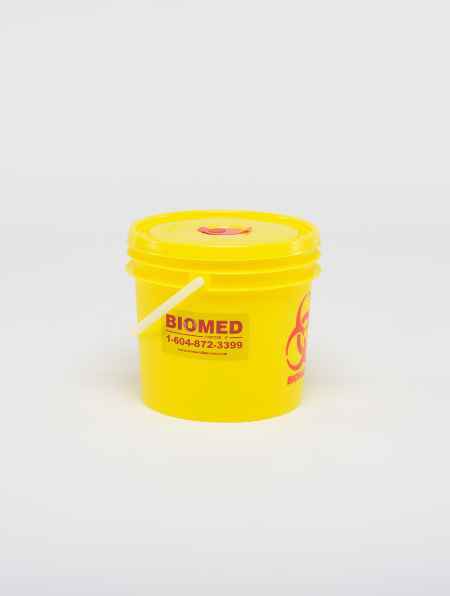 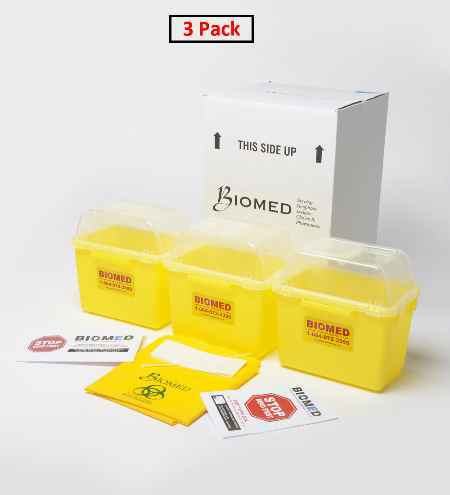 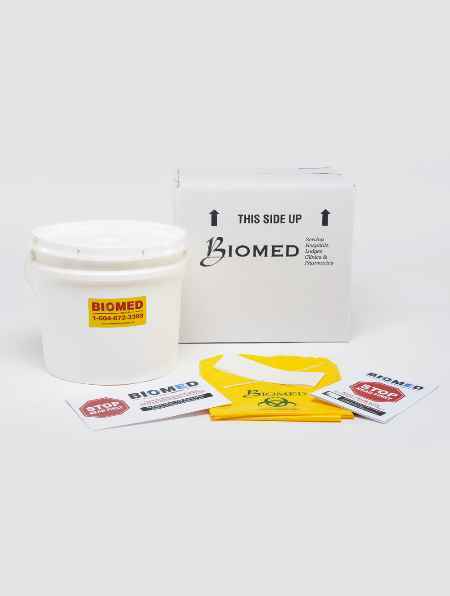 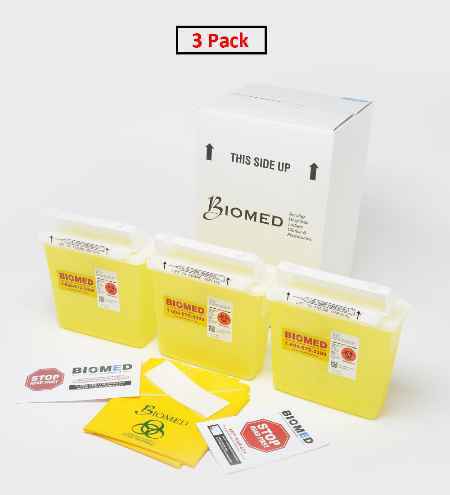 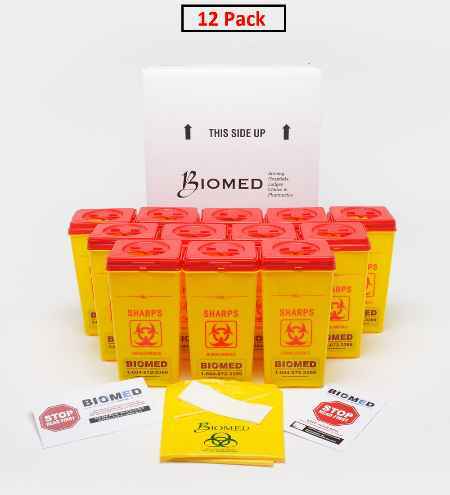 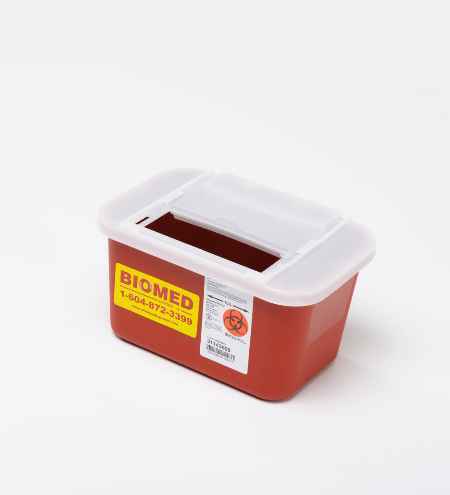 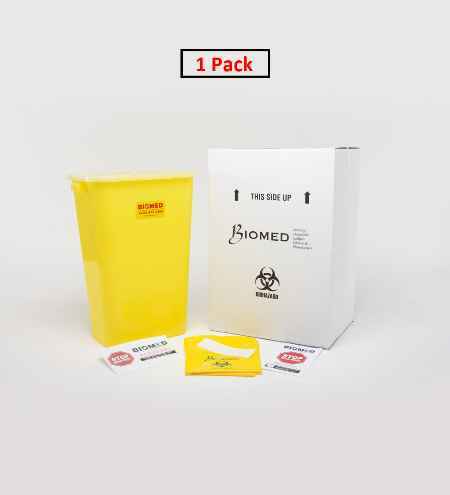 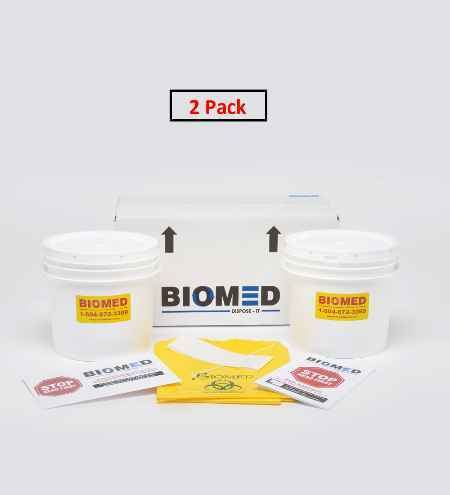 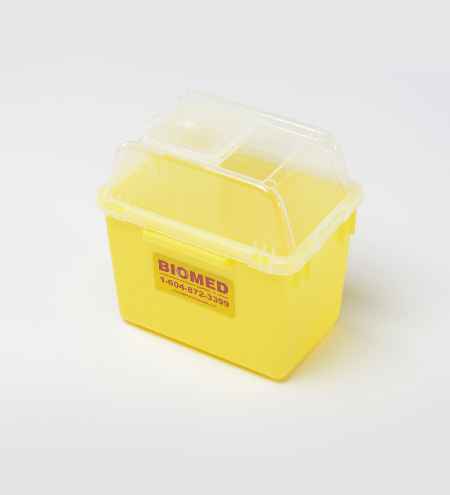 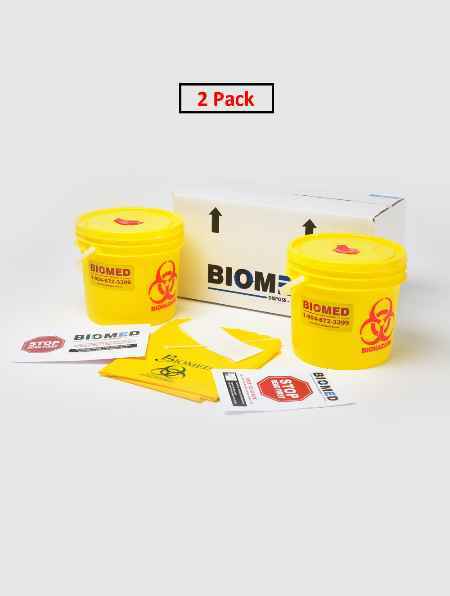 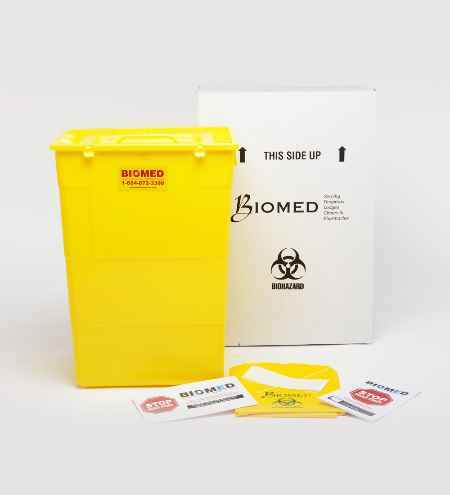 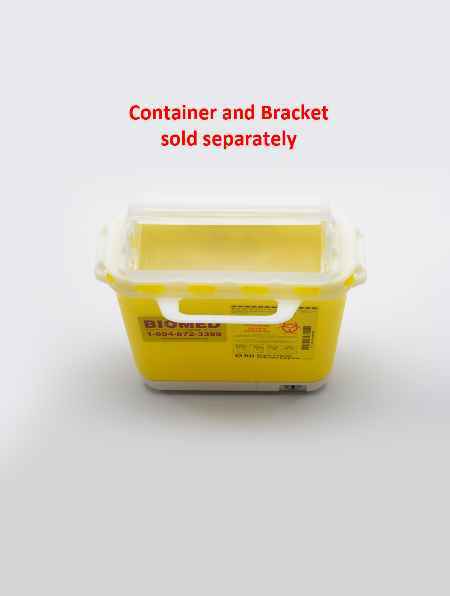 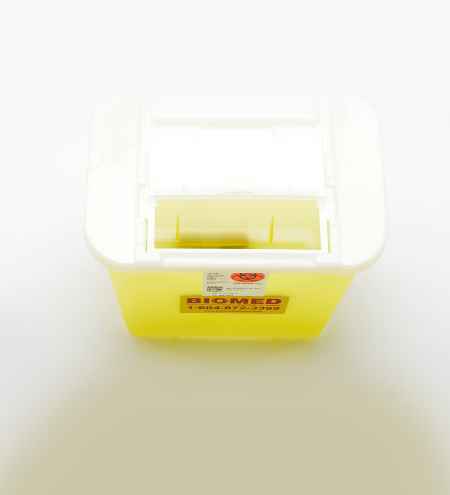 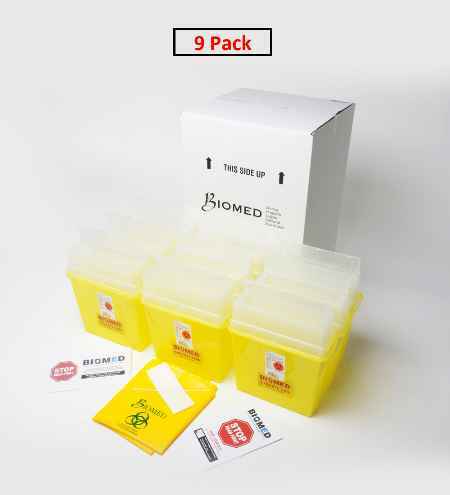 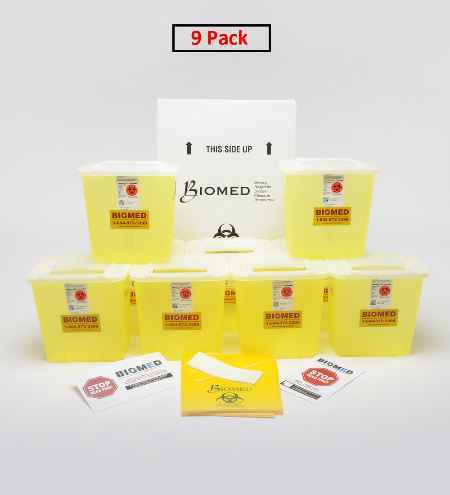 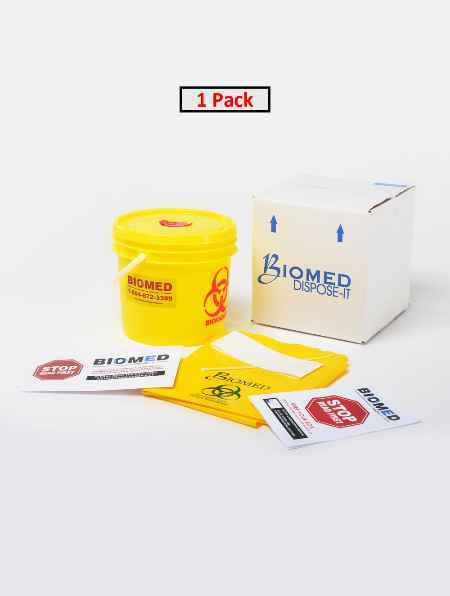 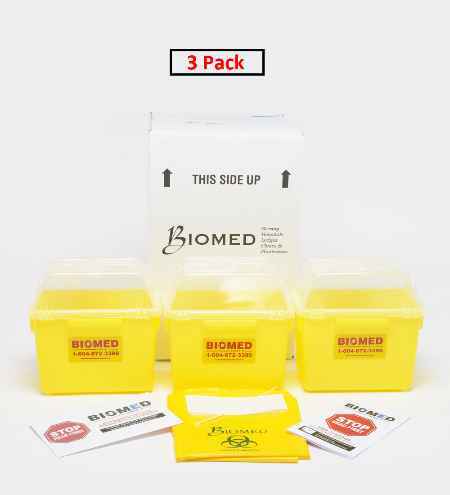 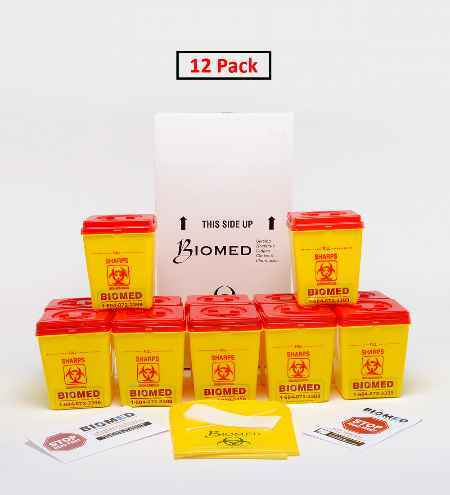 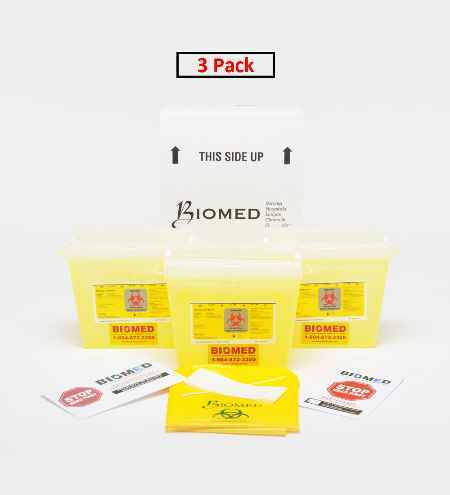 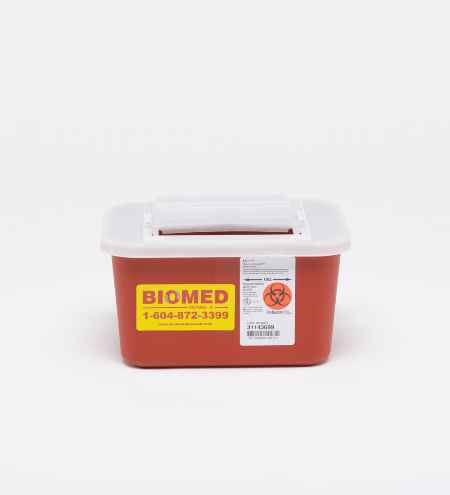 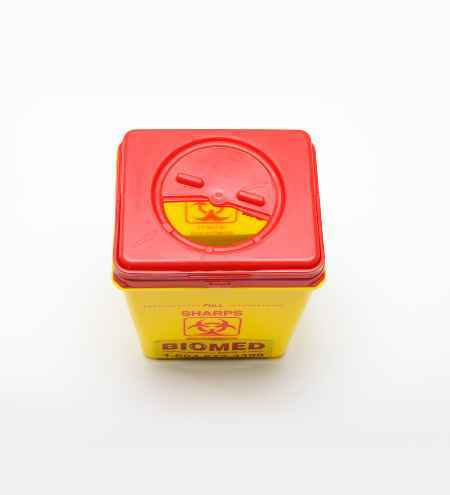 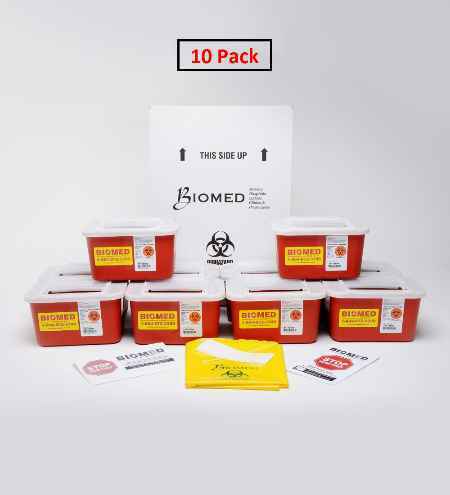 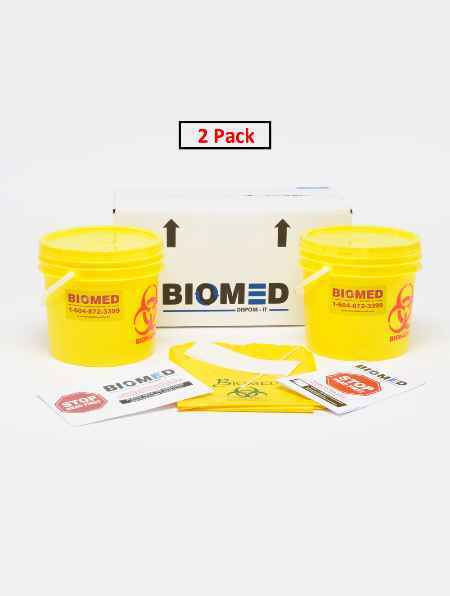 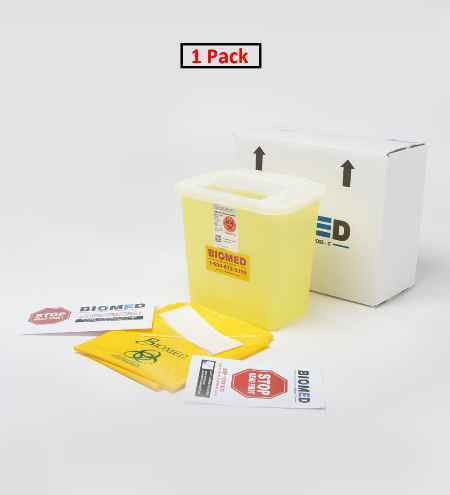 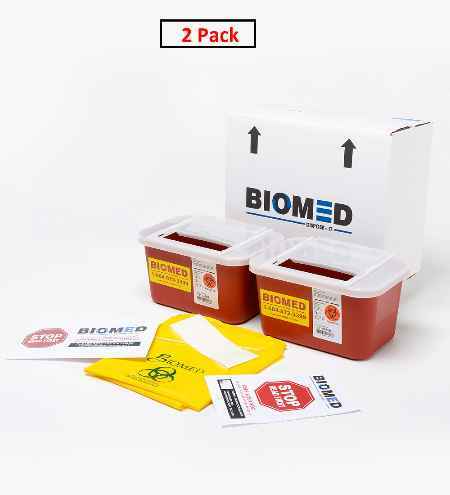 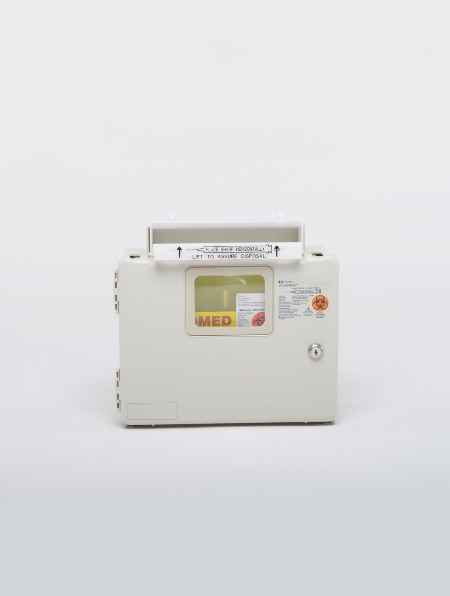 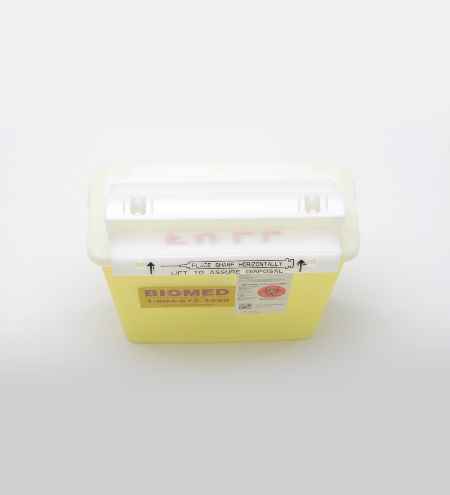 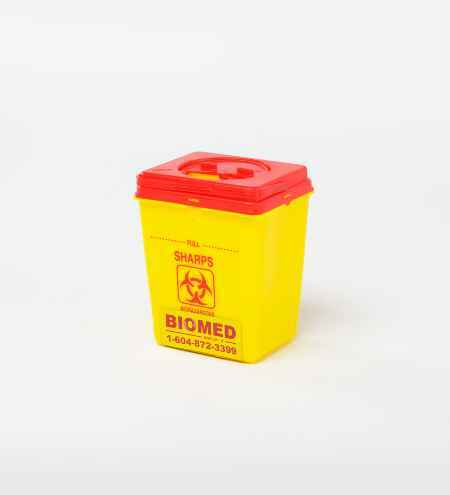 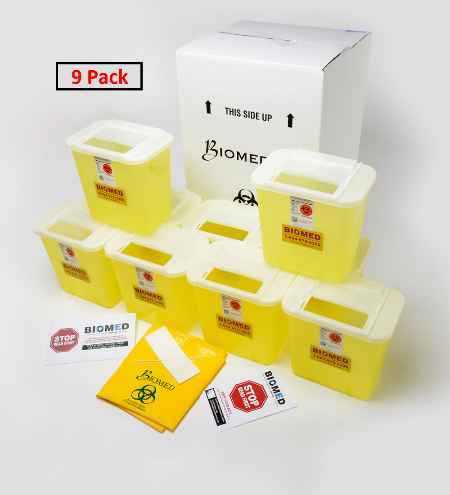 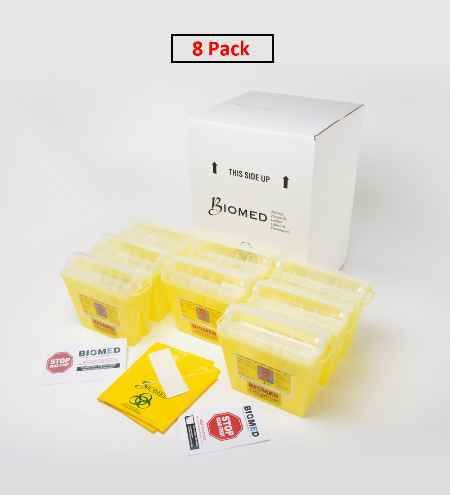 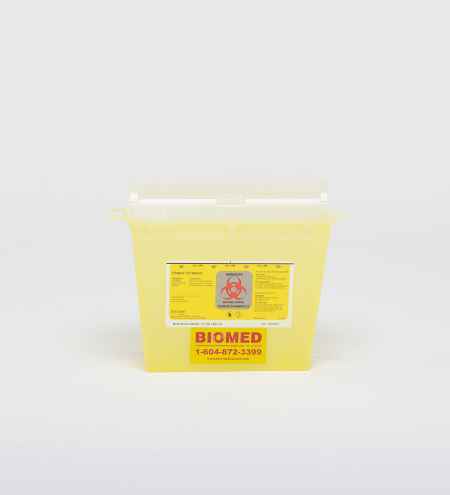 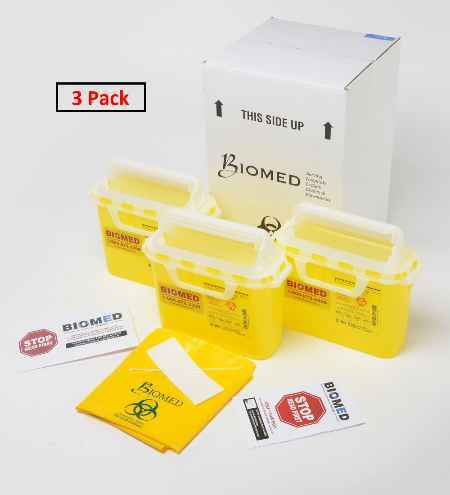 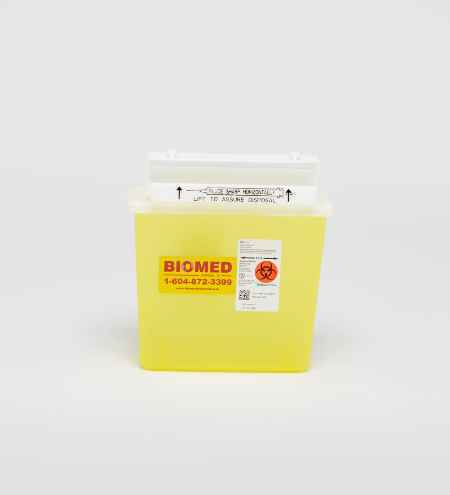 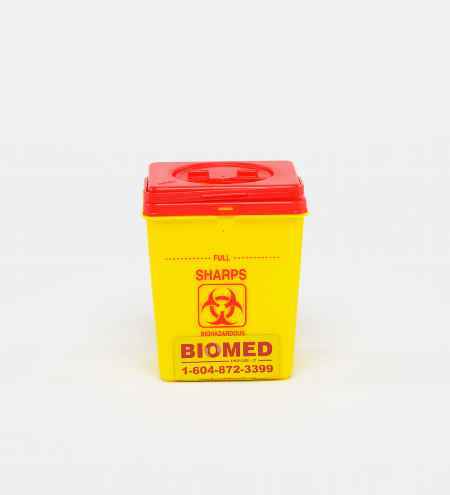 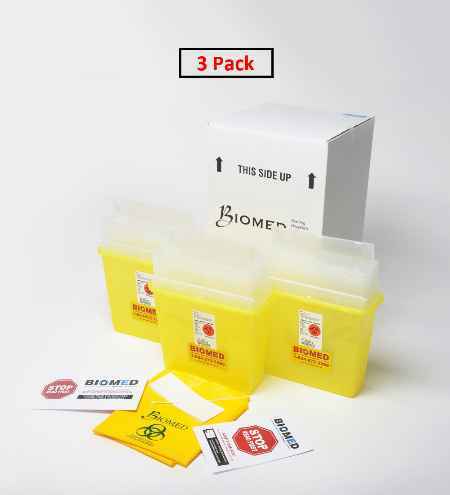 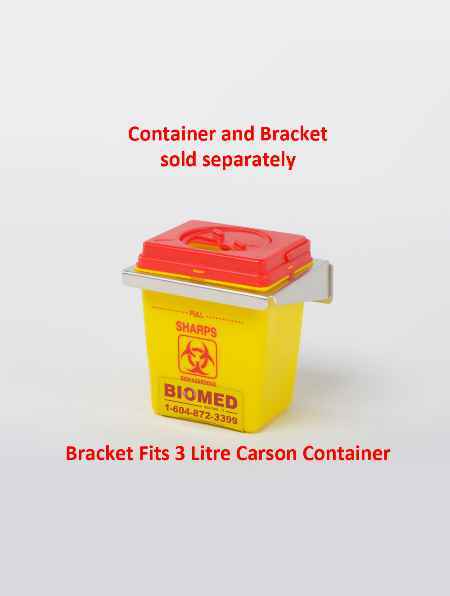 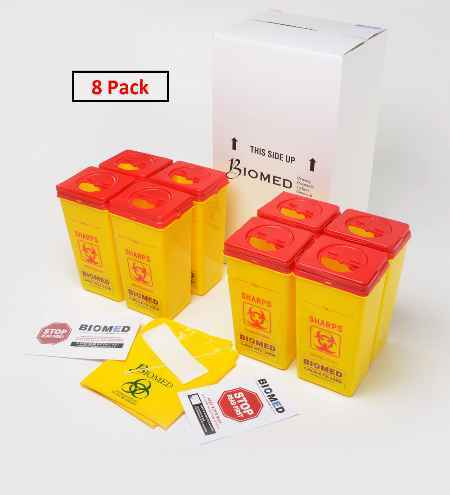 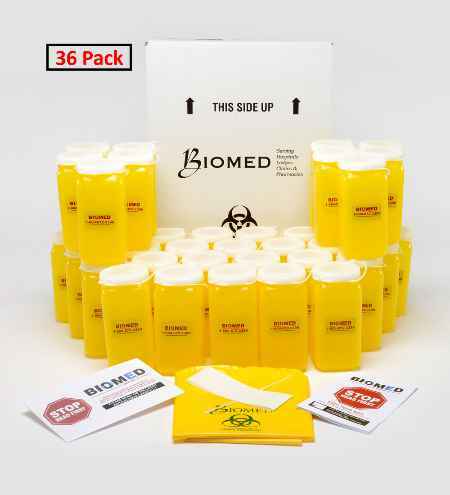 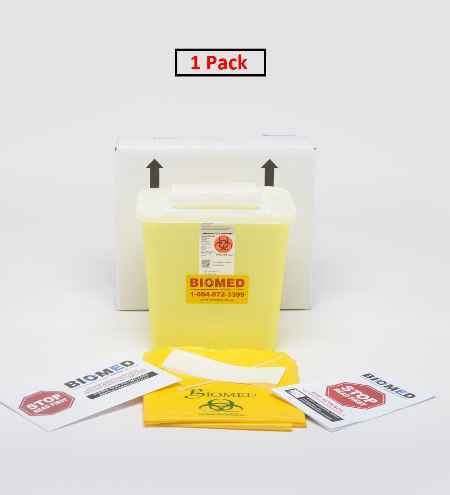 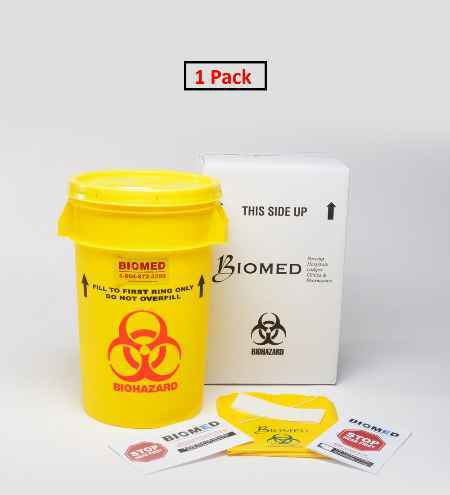 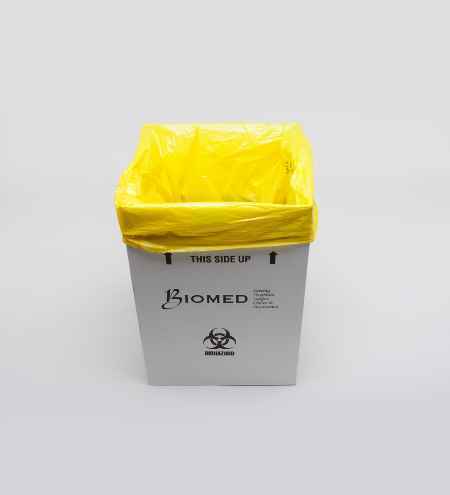 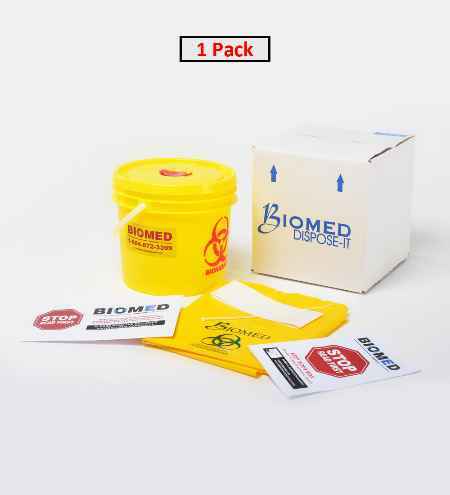 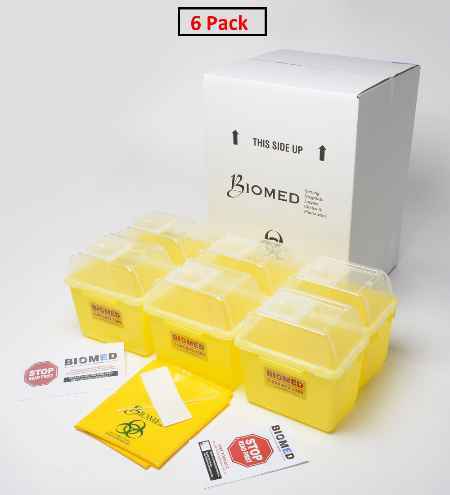 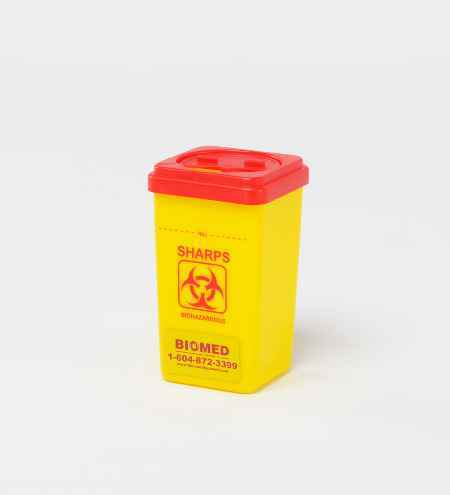 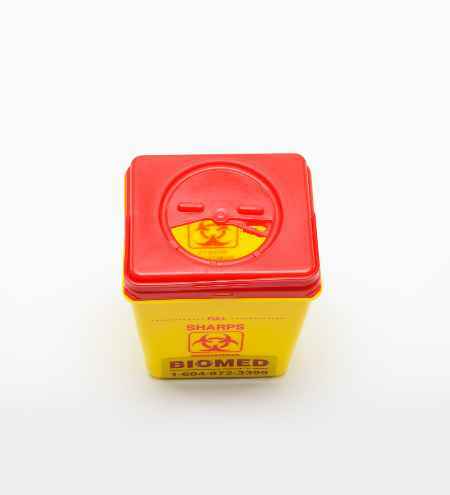 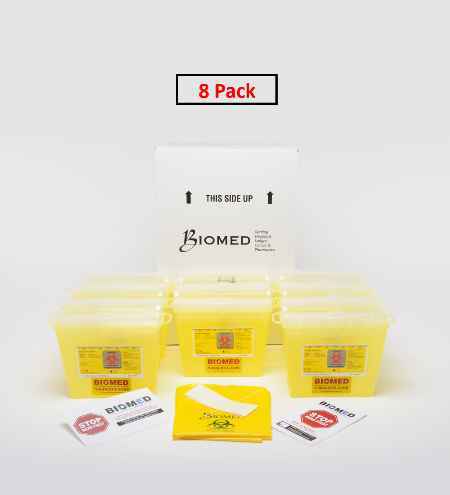 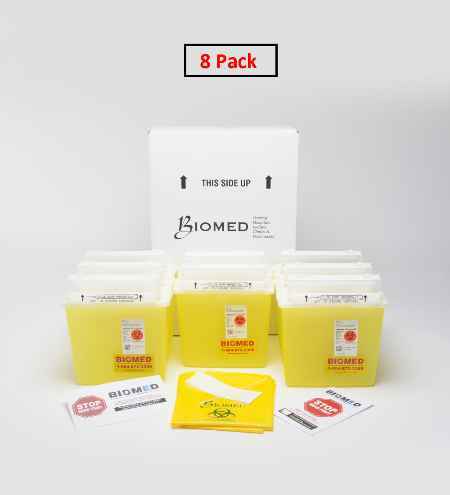 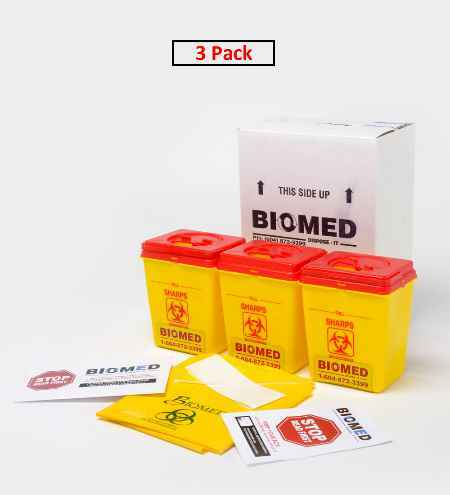 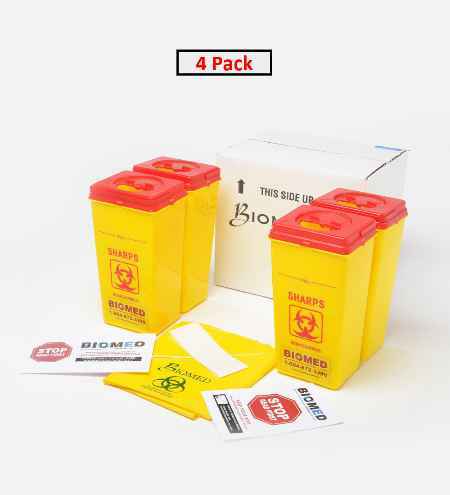 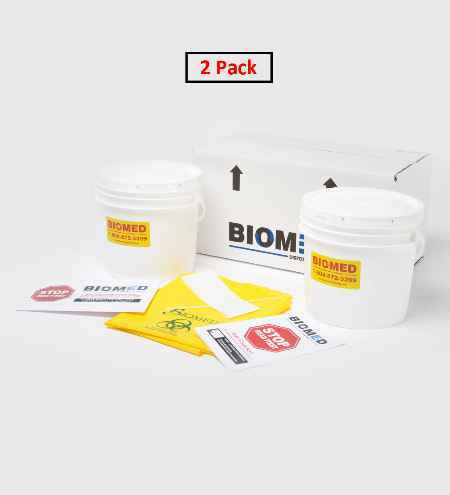 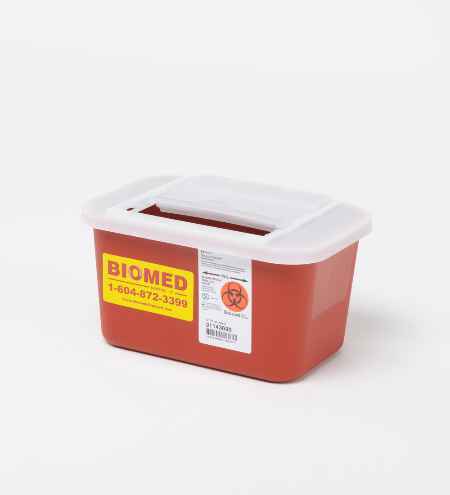 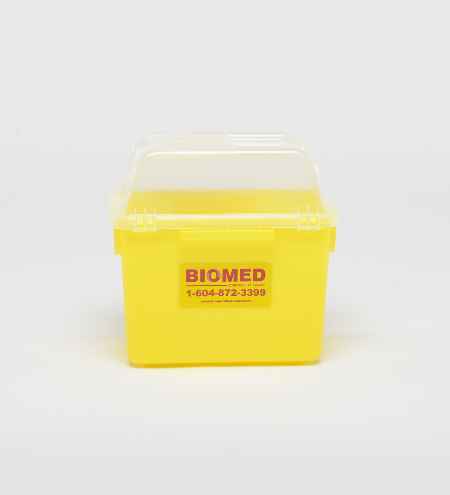 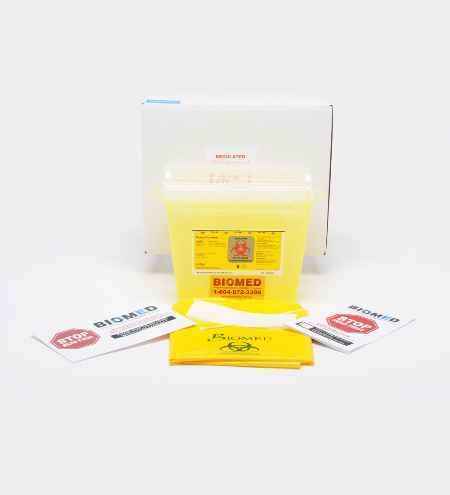 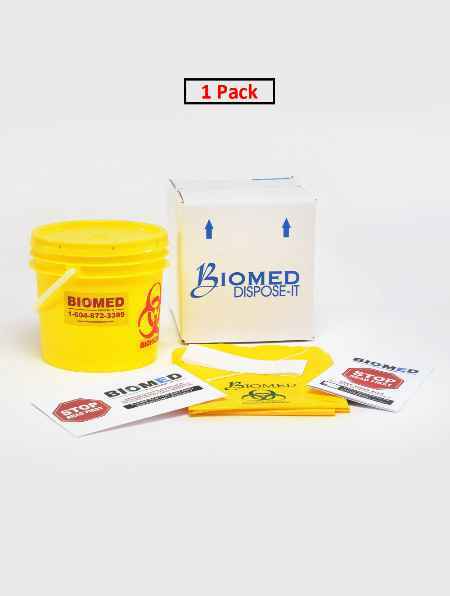 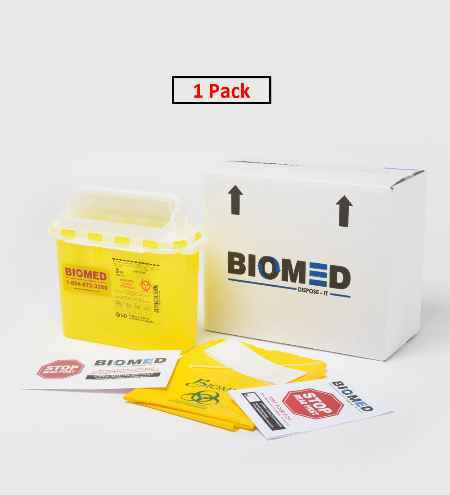 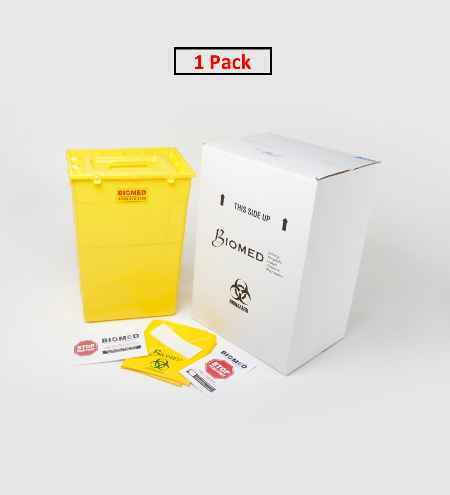 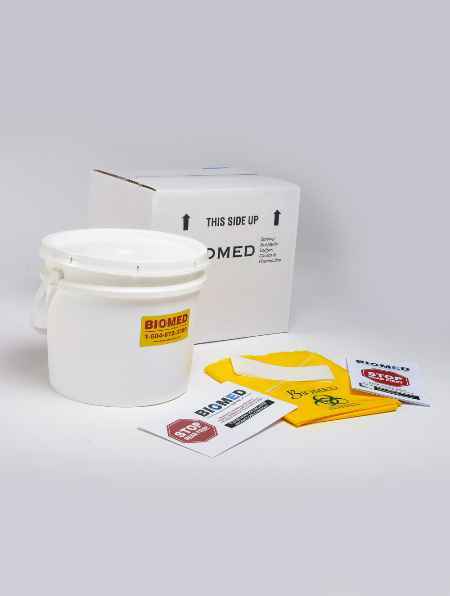 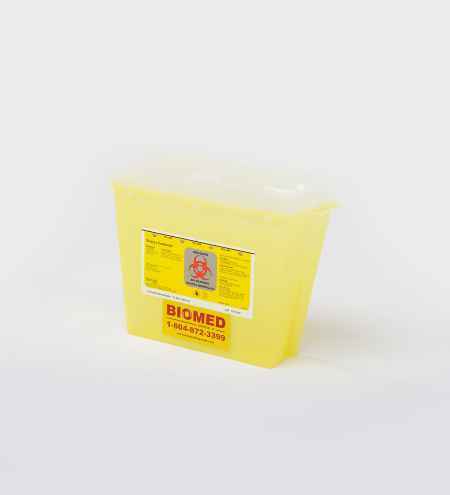 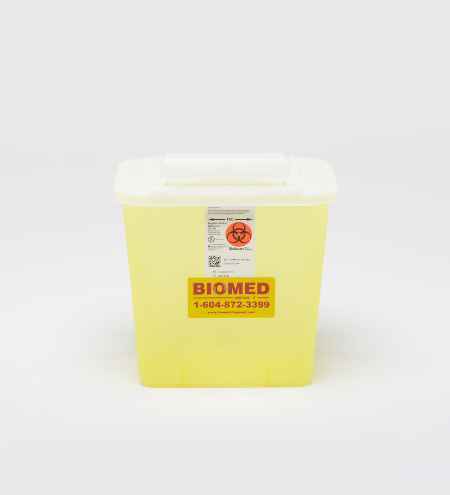 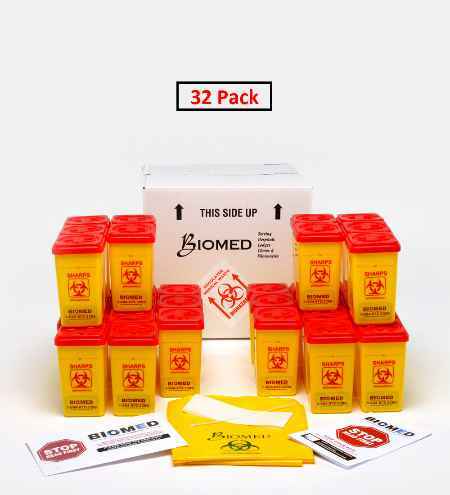 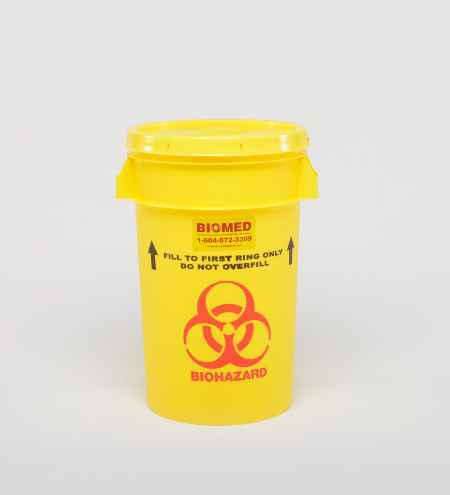 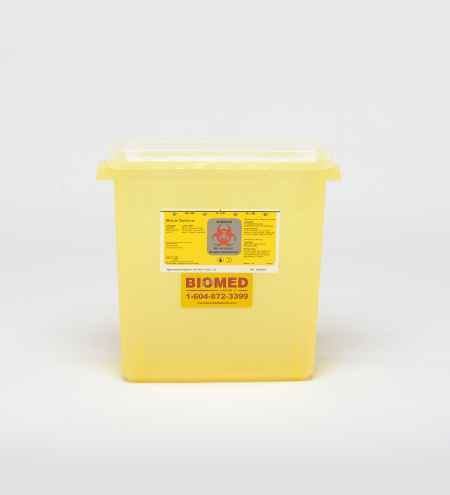 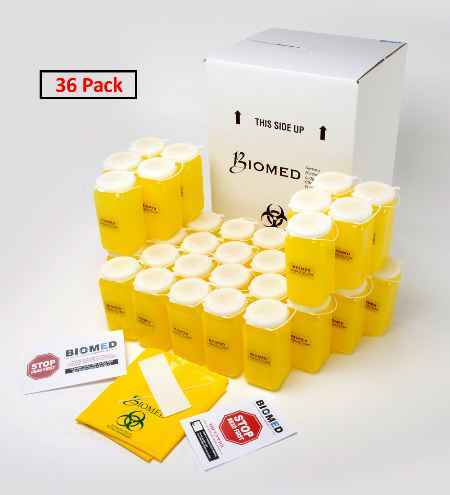 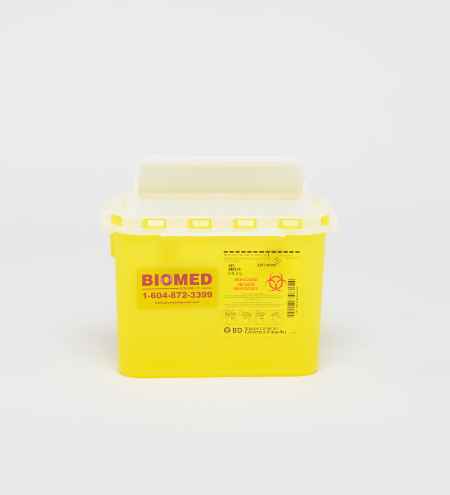 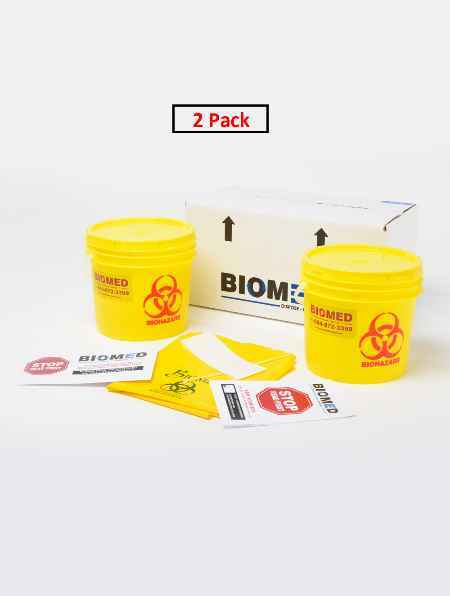 DimensionsLength:10 " Width:4 " Height:9 "
DimensionsLength:20 " Width:14 " Height:22 "
DimensionsLength:8 " Width:6 " Height:10 "
Description 8 Litre yellow biohazard sharps container has a economical horizontal drop lid that maximizes the container volume. 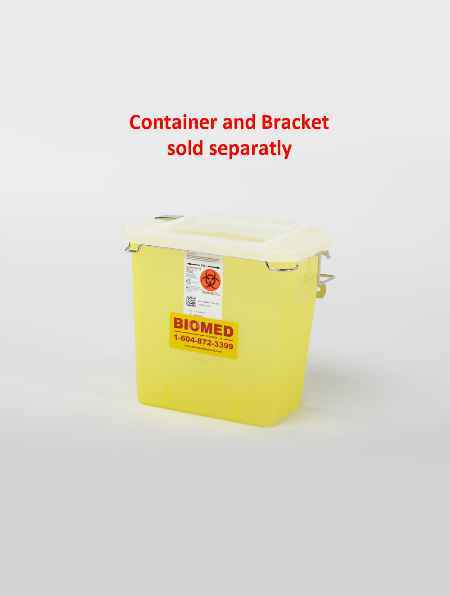 Large horizontal openings accommodate syringes. Containers lock for final disposal. 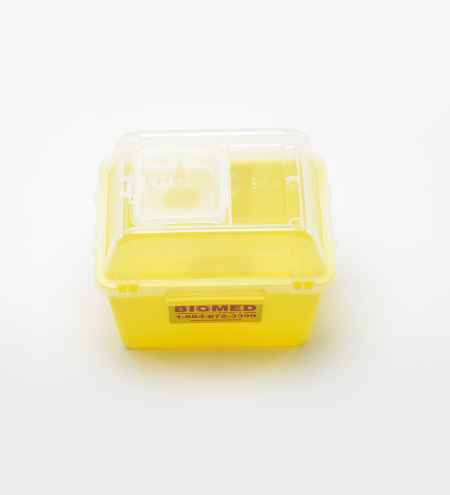 Nestable containers save valuable storage space. 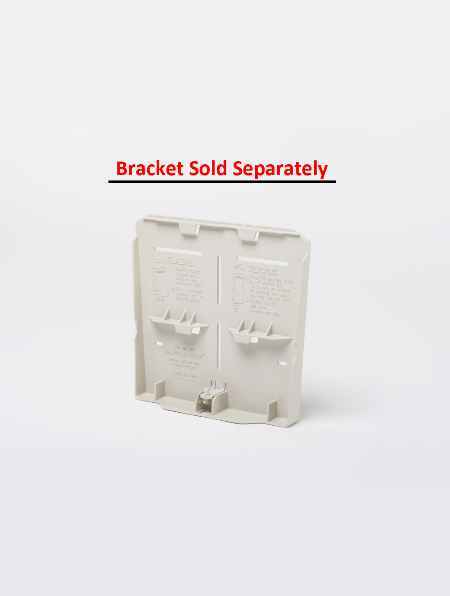 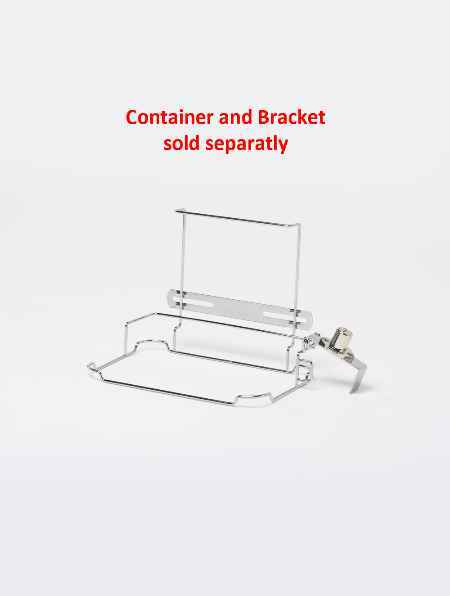 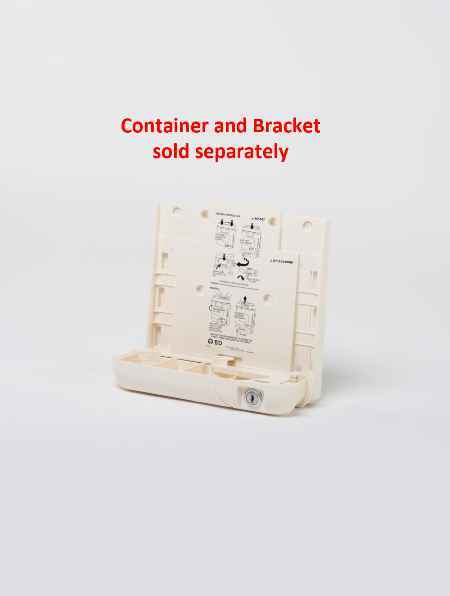 Description Wall mounted locking bracket for 8 Litre Sharp container. 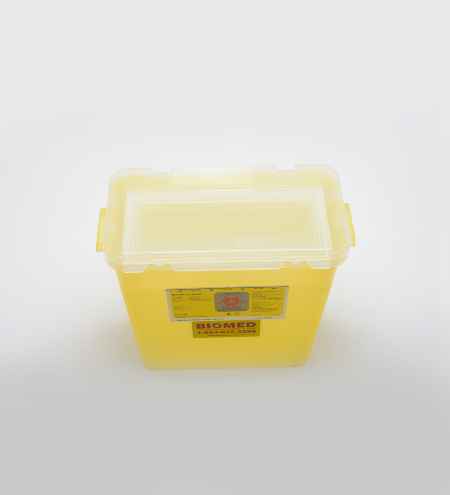 DimensionsLength:11 " Width:11 " Height:10 "
DimensionsLength:11 " Width:5 " Height:13 "
DimensionsLength:12 " Width:12 " Height:19 "
DimensionsLength:15 1/2" Width:11 " Height:22 "
Description 44 Litre yellow biohazard sharps container with hinged lids with separate round opening accepts small items, molded in handles for easy lifting & transport. 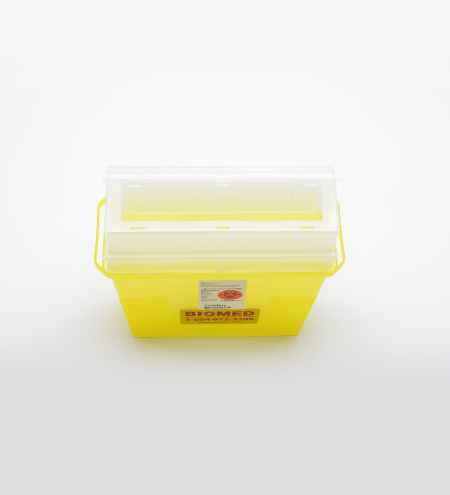 DimensionsLength:15 1/2" Width:11 1/2 " Height:22 "
DimensionsLength:16 " Width:16 " Height:24 "
Description Large Clean - Up Box is used for transporting sharps containers. 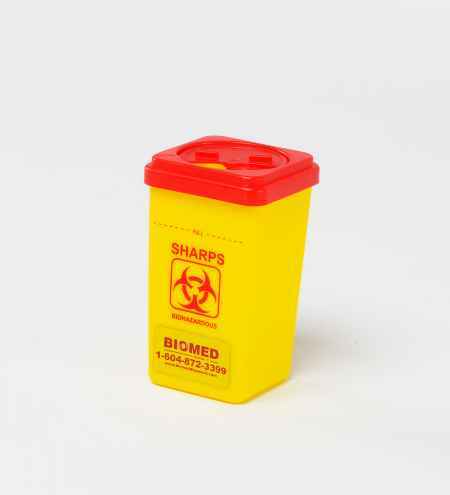 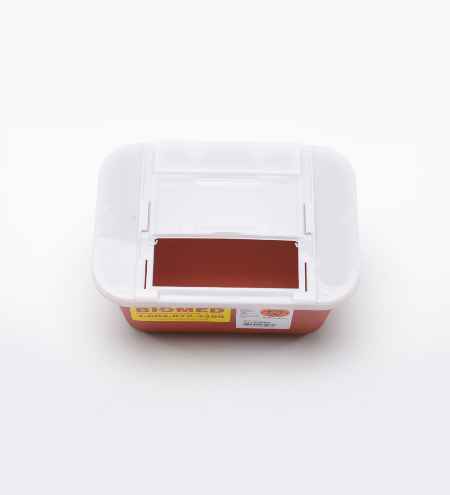 Sharps/needles/syringes MUST be in plastic sharps container before using this box. 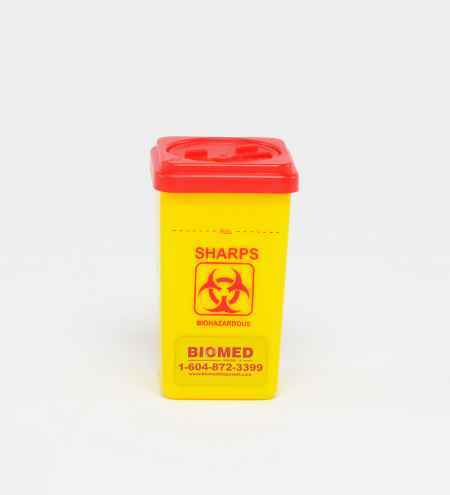 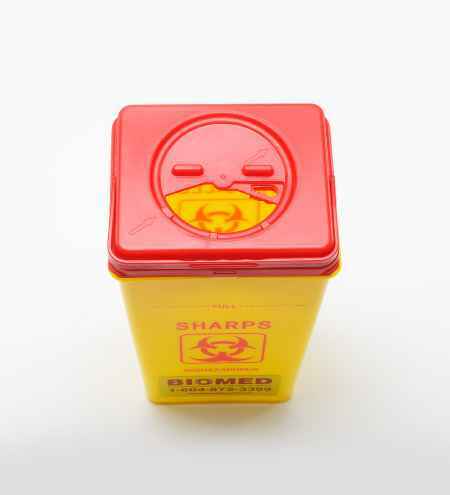 This box may NOT be used for any loose sharps that are not in appropriate hard, plastic, locking, sharps containers.